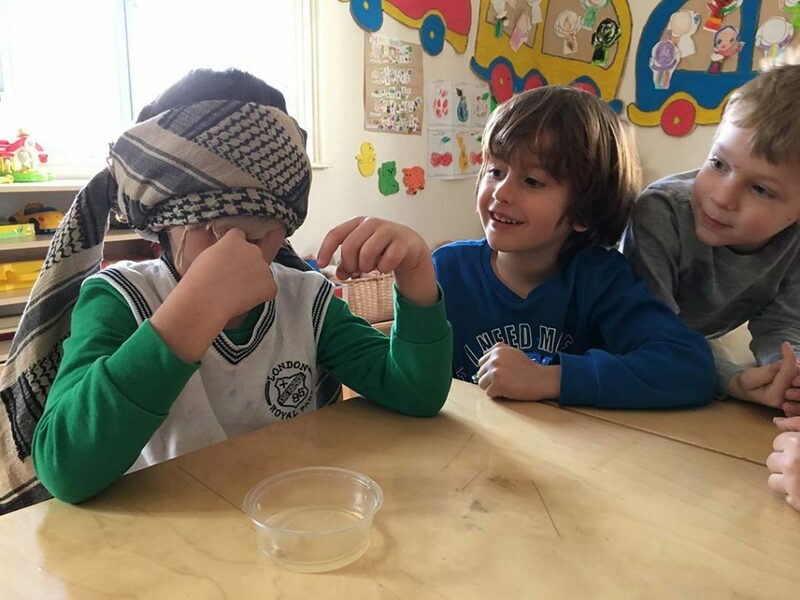 After speaking about human body’s parts, we discovered our five senses. 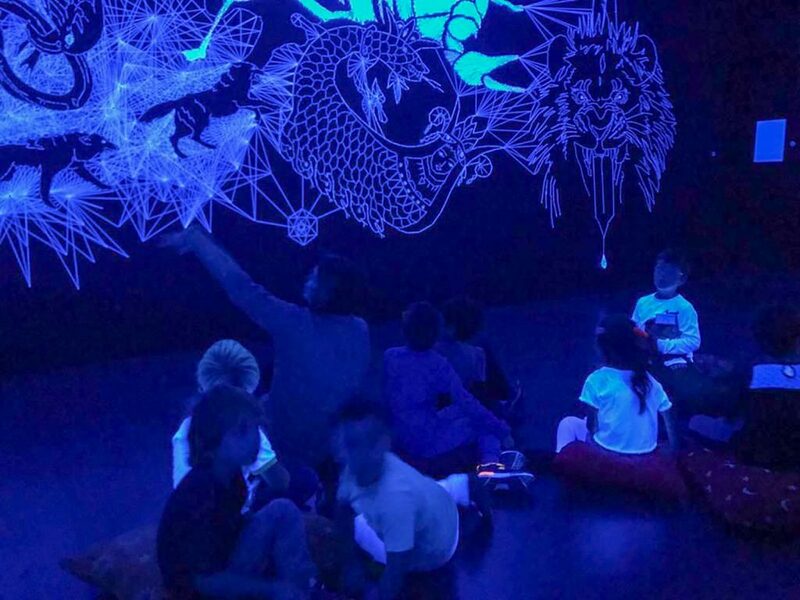 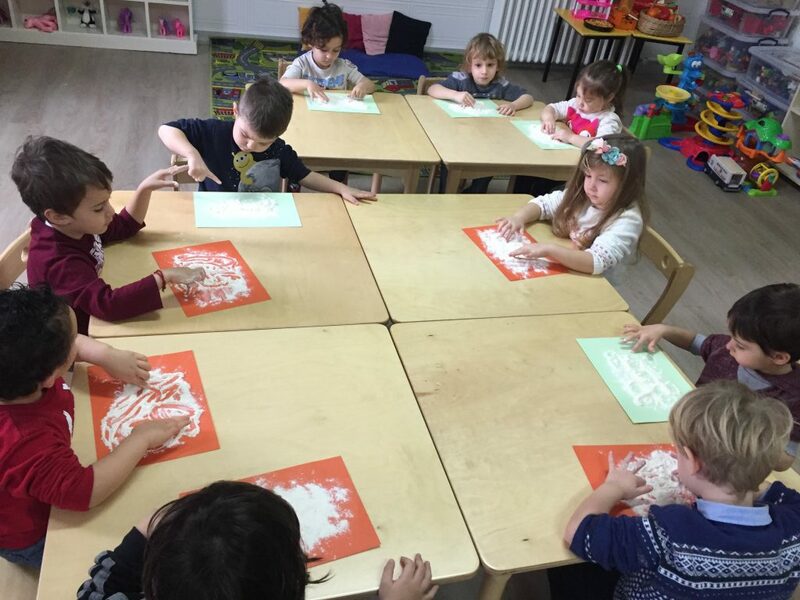 Through some experiments and lots of fun, we could understand the importance that each of them has in our daily life. 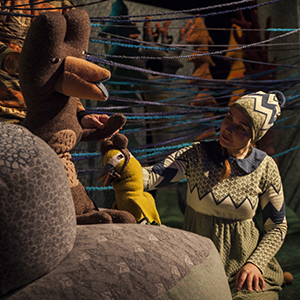 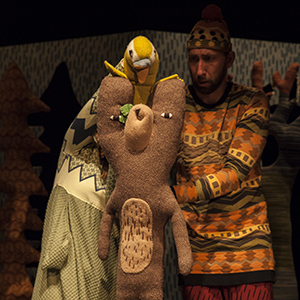 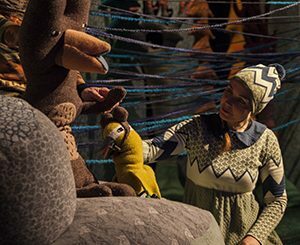 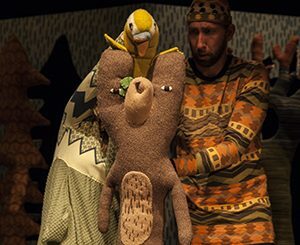 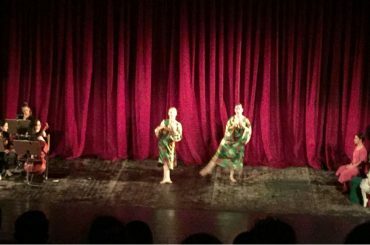 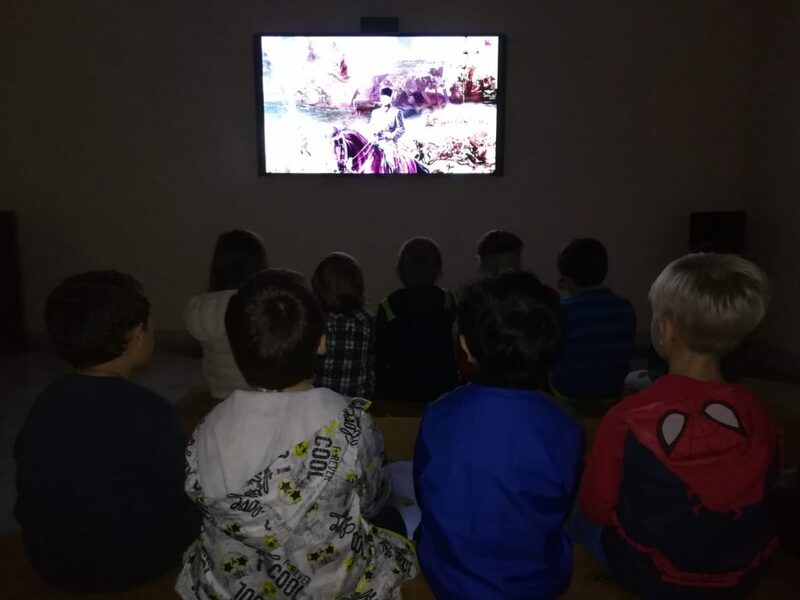 This year we had a lot of fun watching “Good night”: it is really hard to fall asleep when the blankets are too short, the pajamas are uncomfortable and nothing lets you relax! 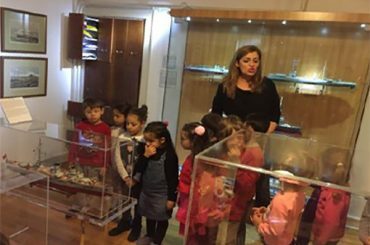 It’s important to be aware of different professions since childhood. 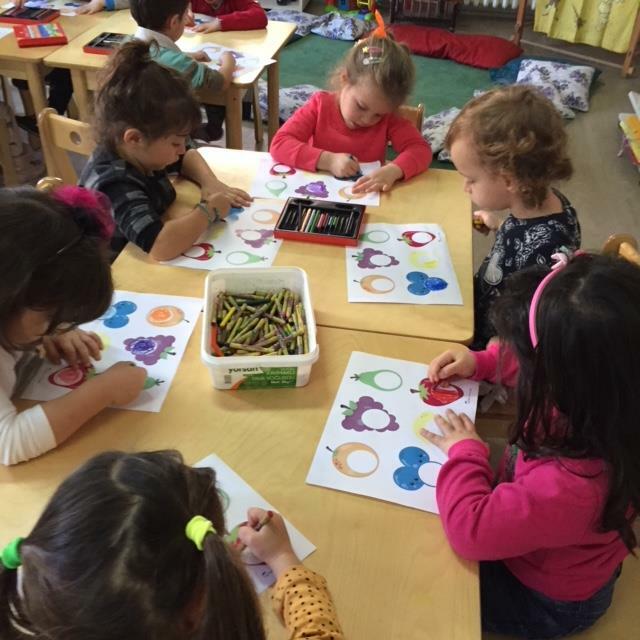 Working is really important for all of us. 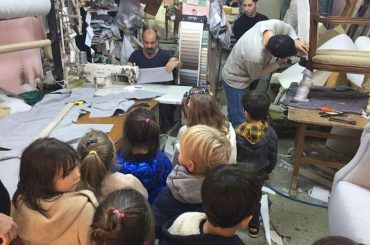 We went to discover an upholsterer’s shop: clothes, furniture to be covered, cotton…! 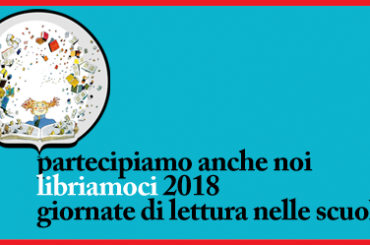 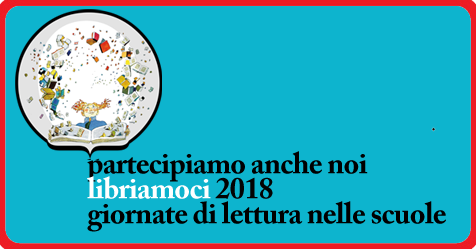 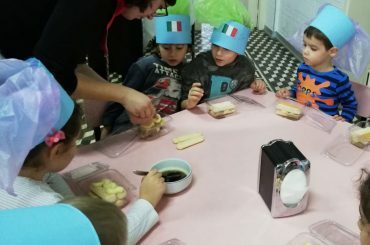 How to prepare a focaccia? 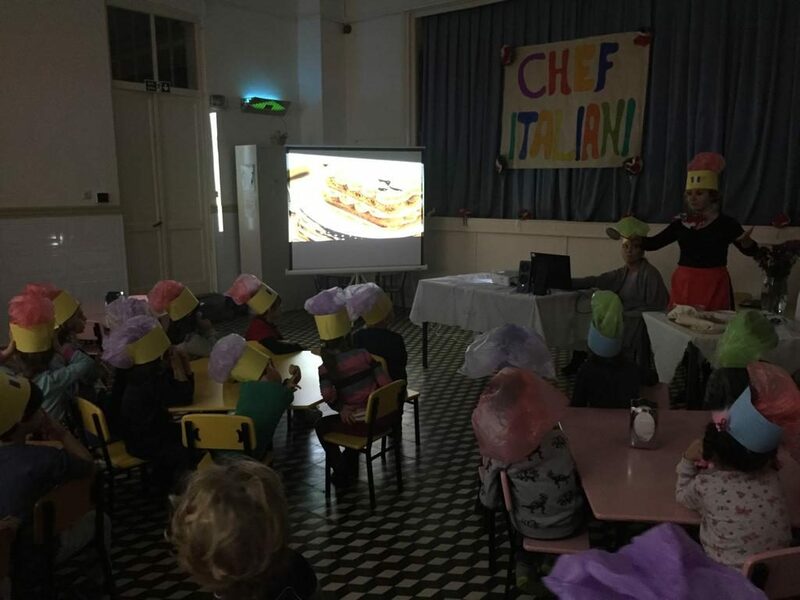 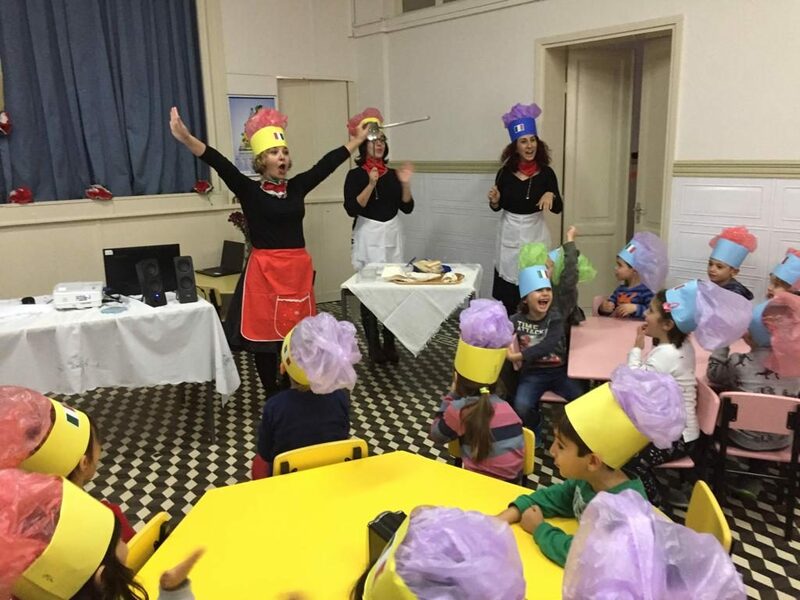 Within the activities related to the project of professions, we decided to give space to chefs, too! 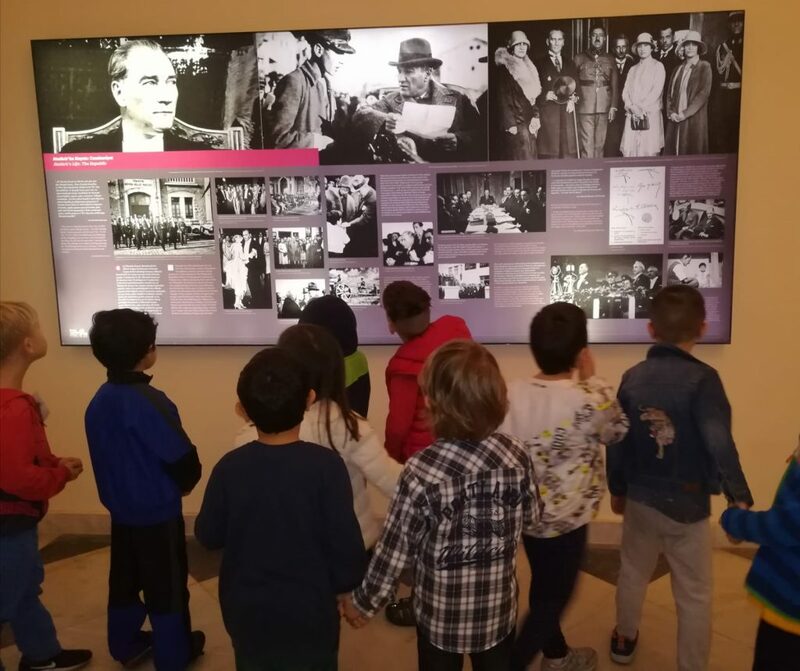 As the Italian tradition recommends, we prepared a very tasty ‘’Focaccia’’ with our teachers. .
We visited the museum of Atatürk with our students to commemorate him. 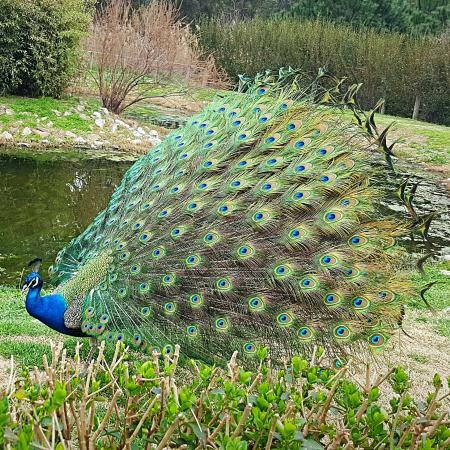 Spring has arrived; many flowers bloomed, trees are now full of green leaves and insects. 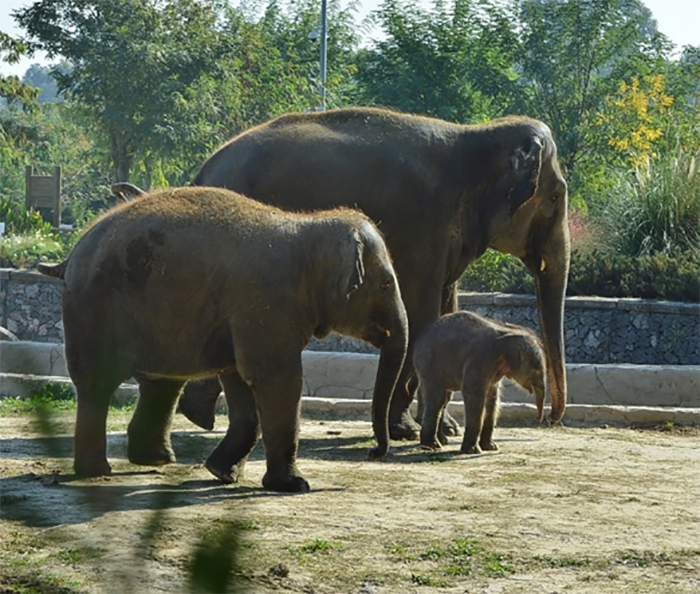 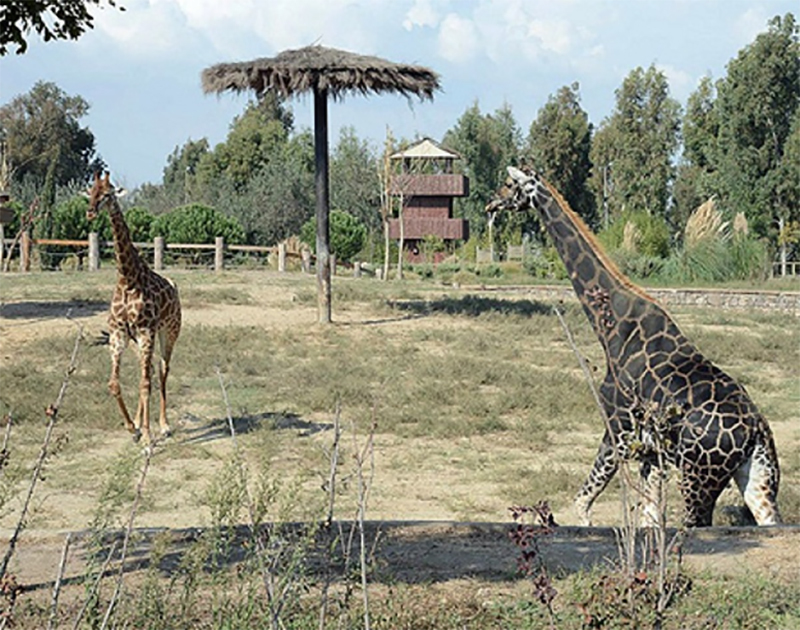 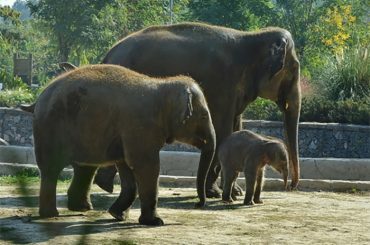 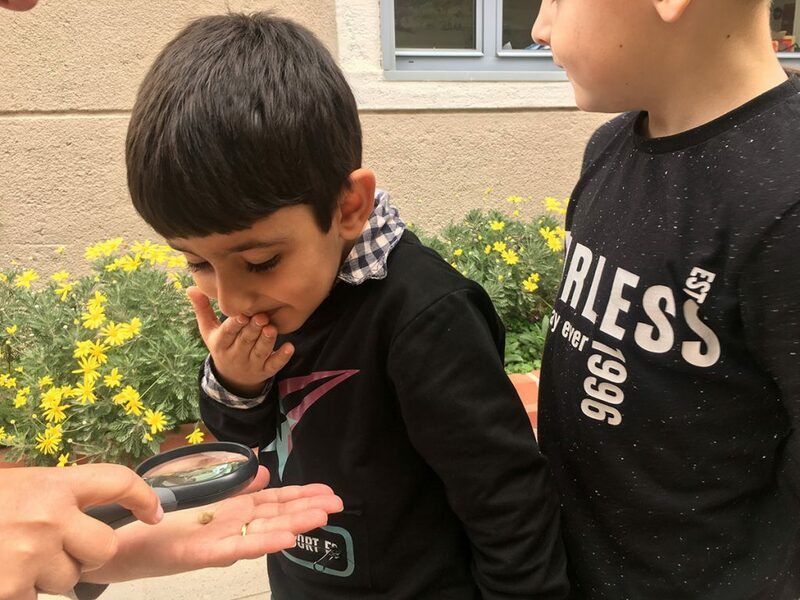 Small animals are around our garden. 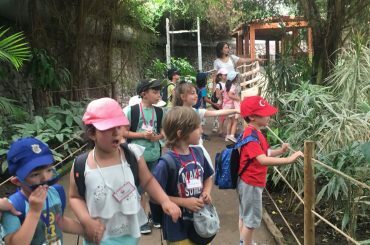 It was really exciting exploring, together with our teachers, the beauty of our environment. 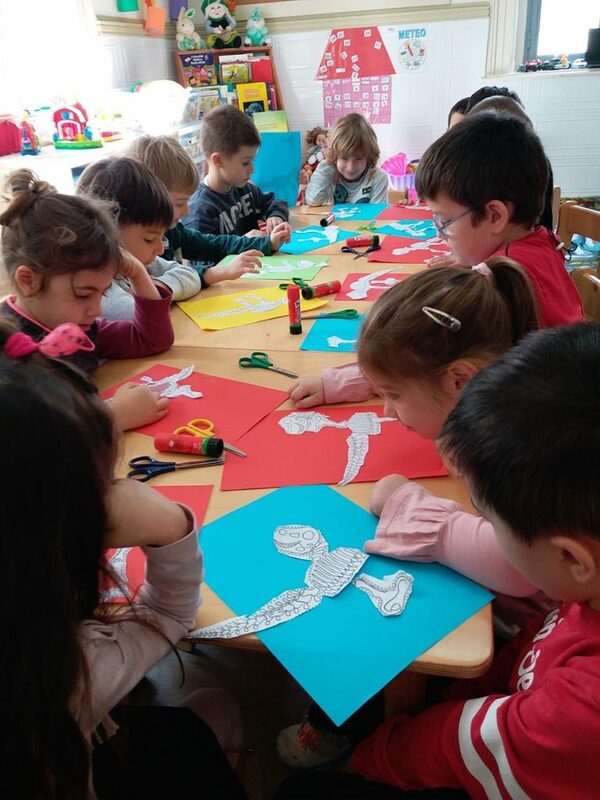 We also studied the life cycle of some animals. 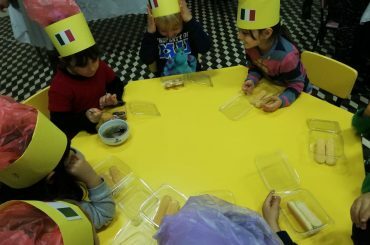 We can learn so many things at school, even how to behave while eating! 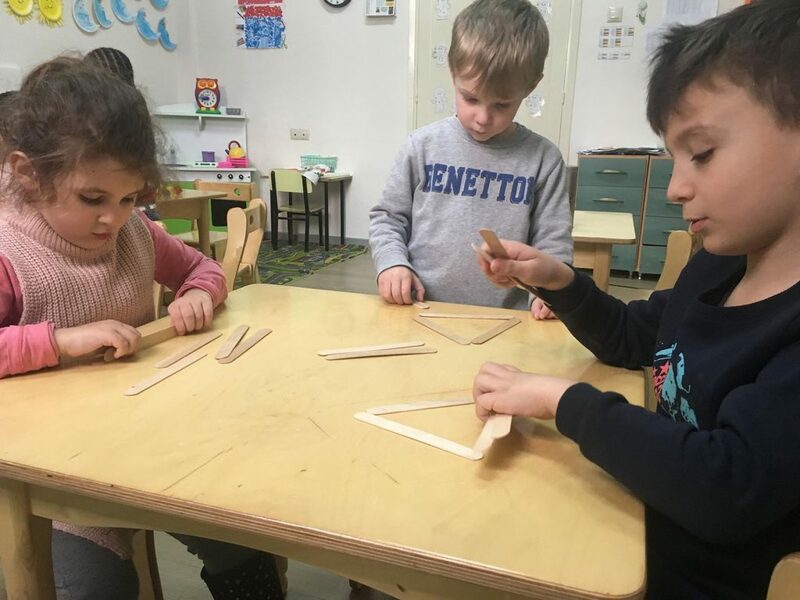 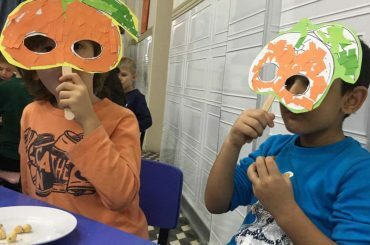 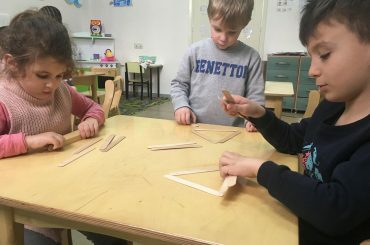 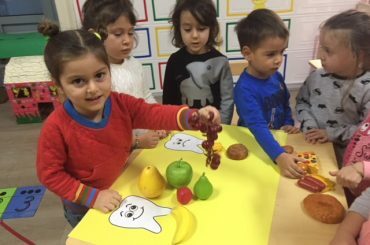 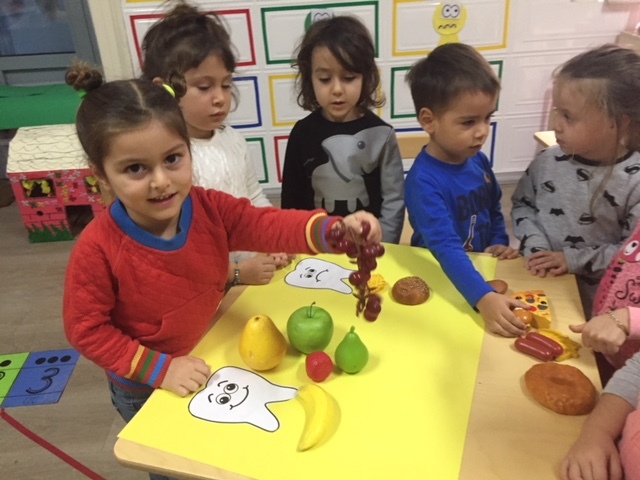 Together with our teachers we learned to setup the table, to sit appropriately and to use forks, knives and spoons in the right way. 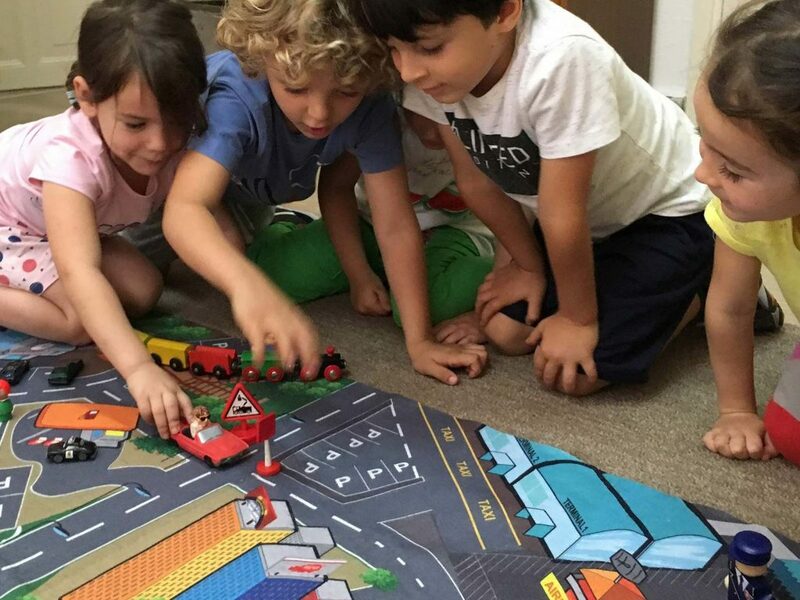 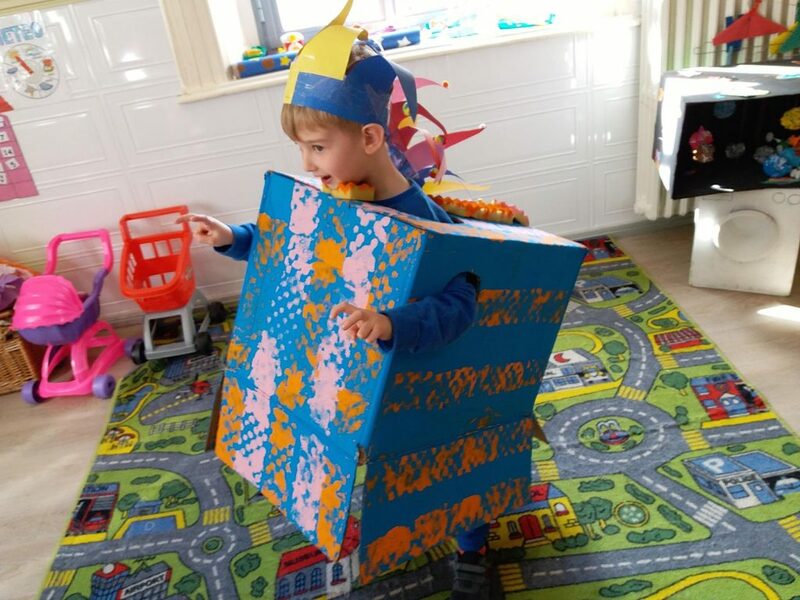 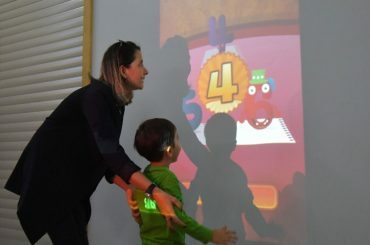 It was funny and useful, now we can help mum and dad at home! 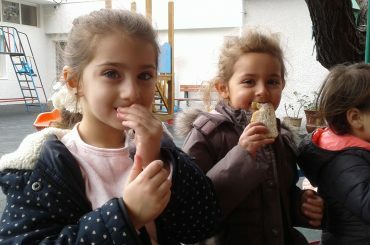 It`s always important knowing how to behave when we walk around the city. 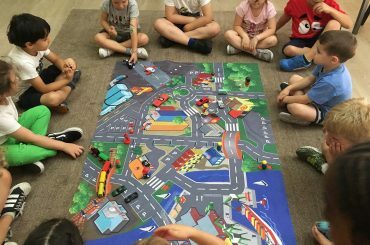 With our teachers we learnt the meaning of the different signals and the rules that we should respect when we cross the road. 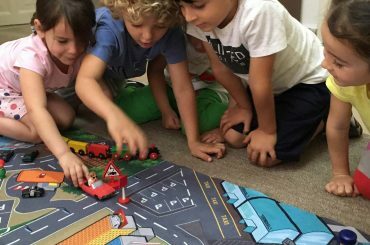 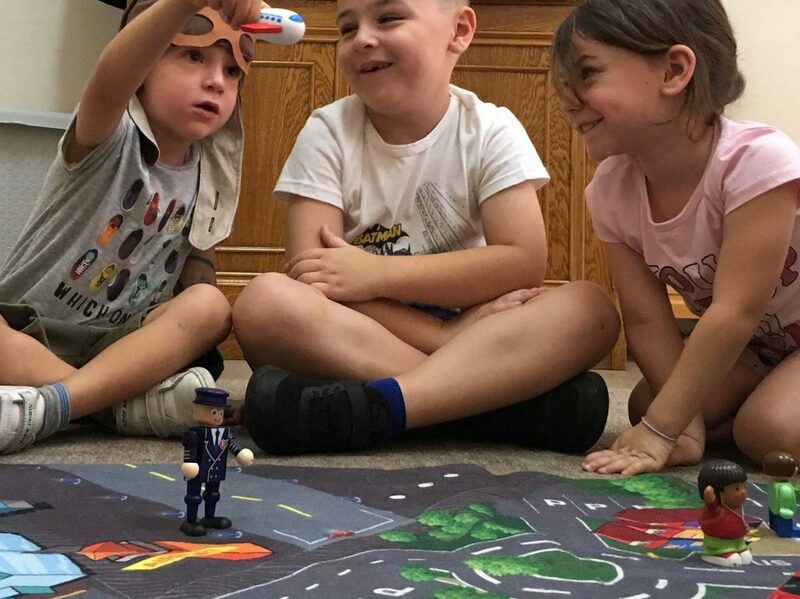 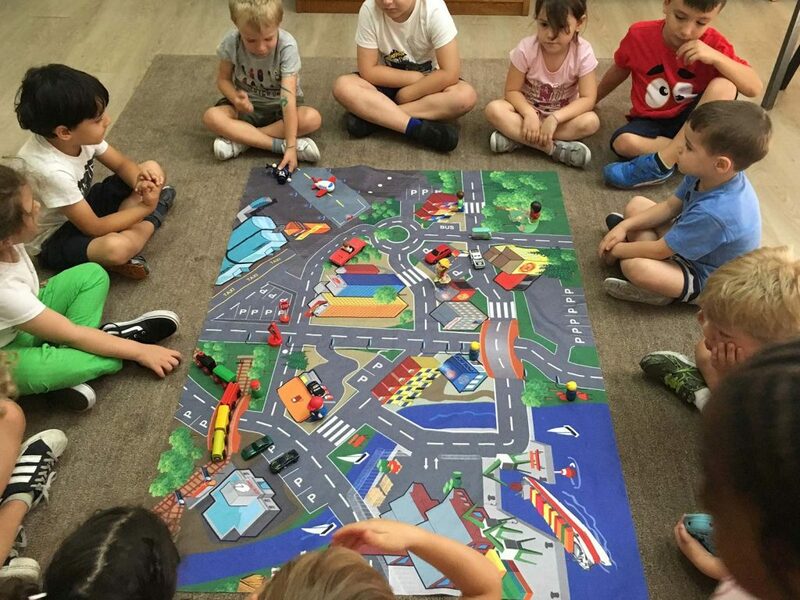 We had lots of fun building a small city in our classroom and driving miniature cars, planes and trains! 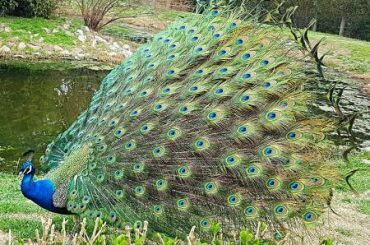 Nature is always full of surprises. 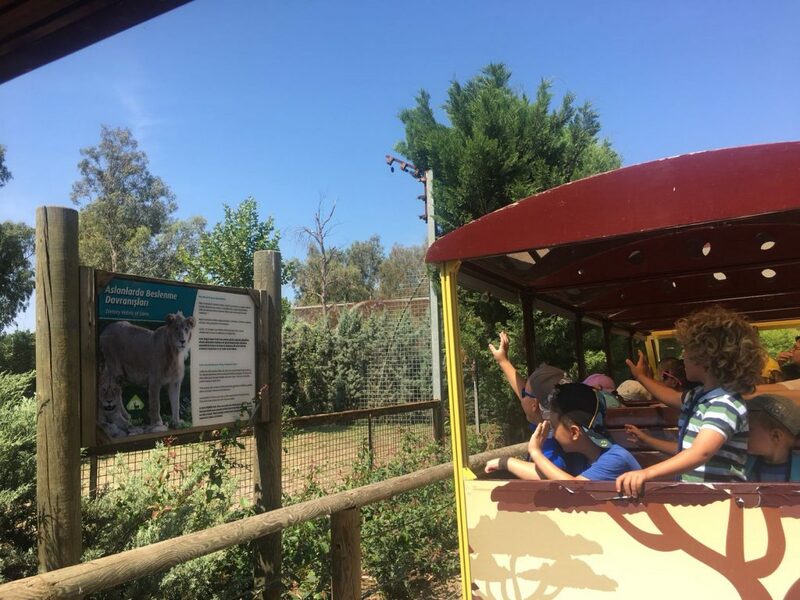 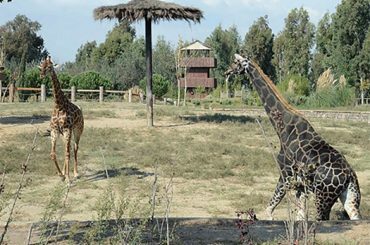 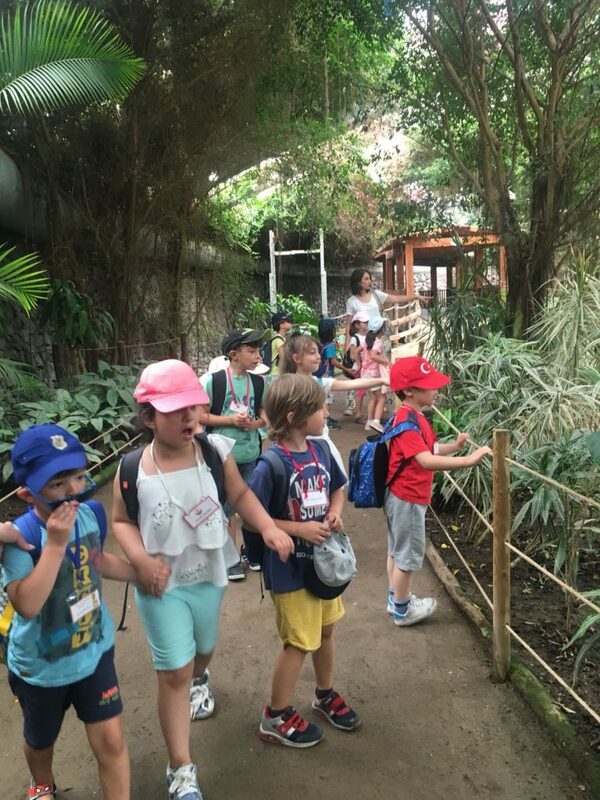 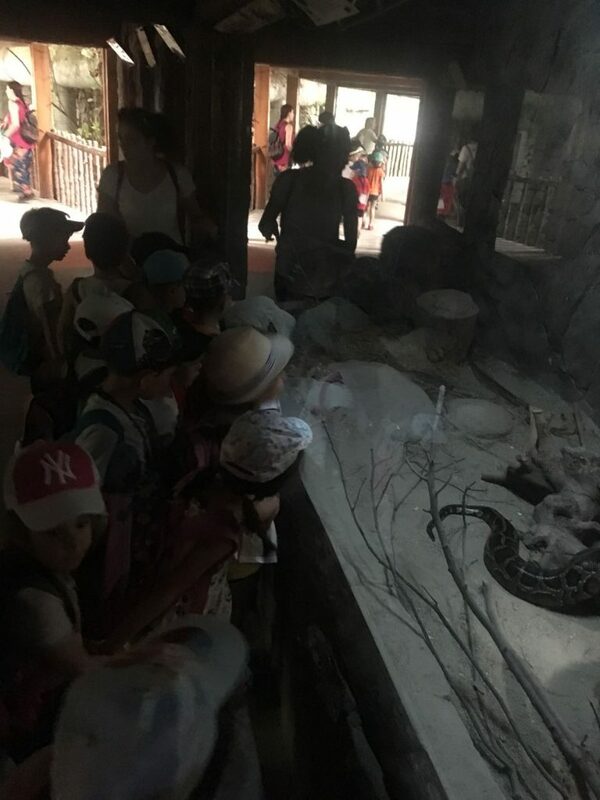 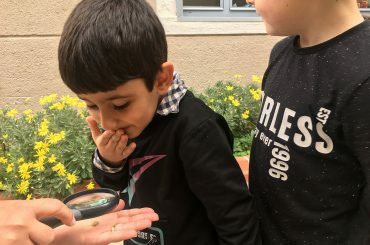 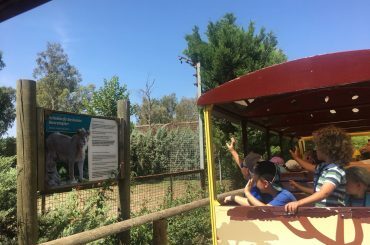 We had a wonderful adventure with animals and plants. 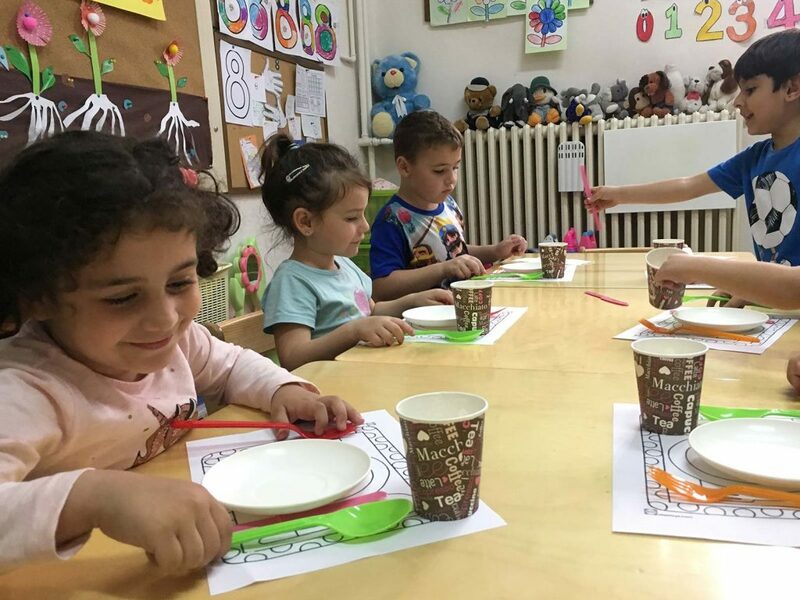 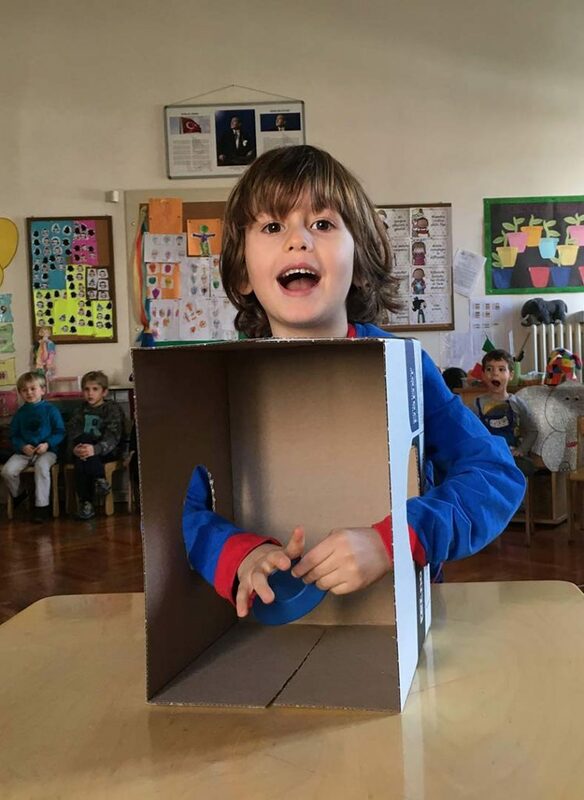 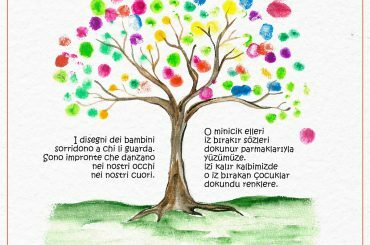 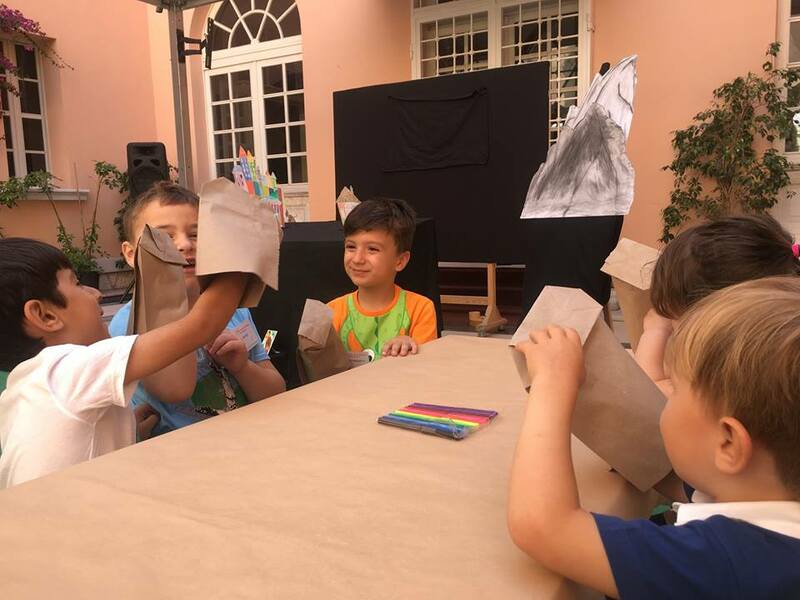 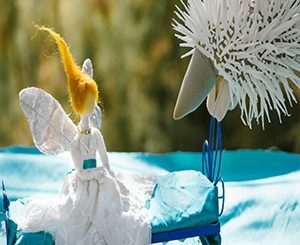 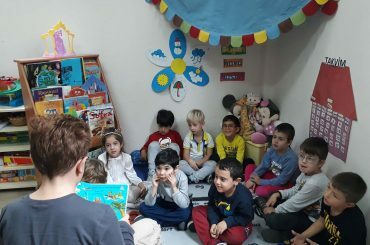 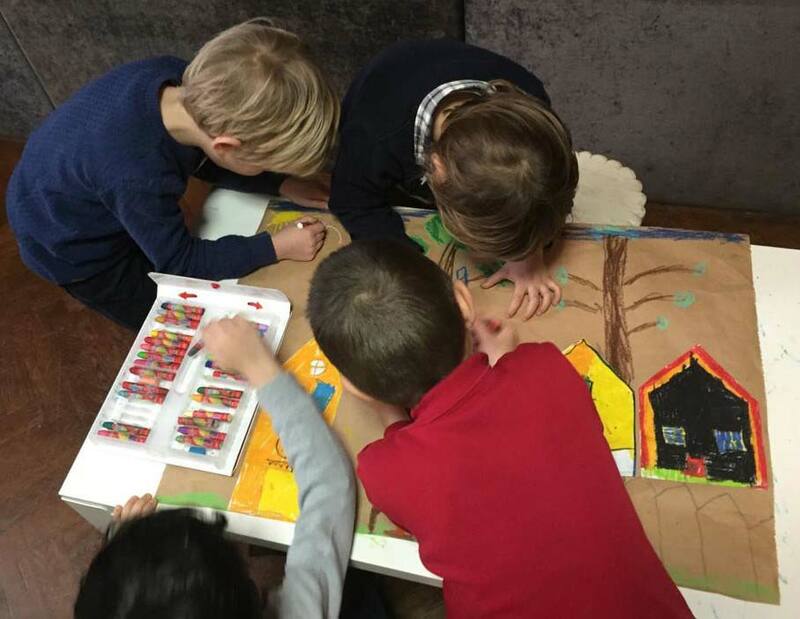 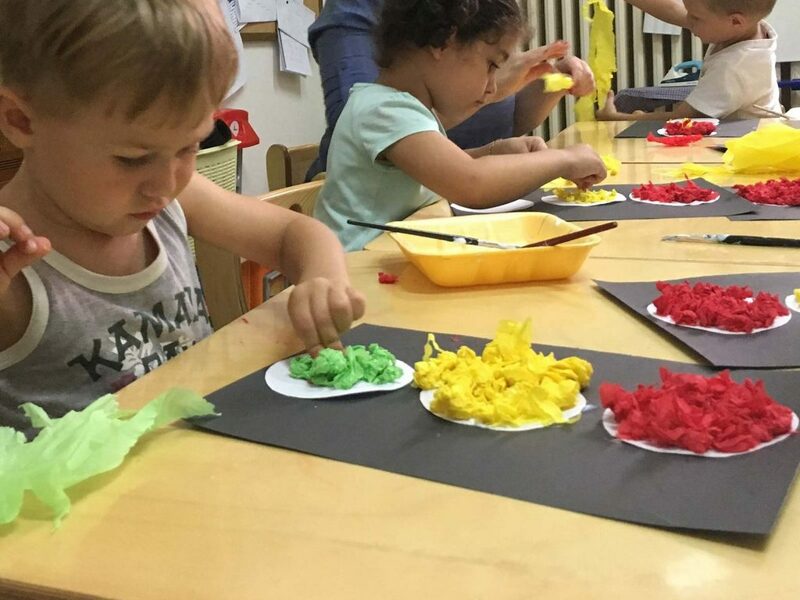 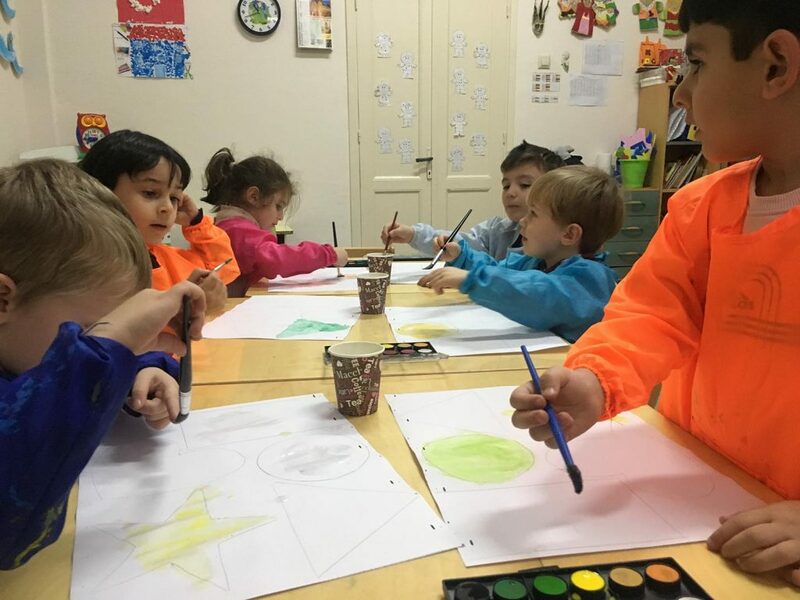 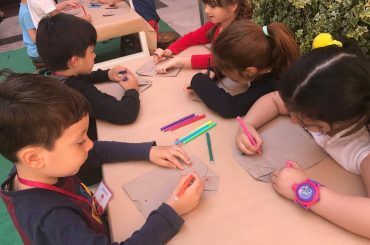 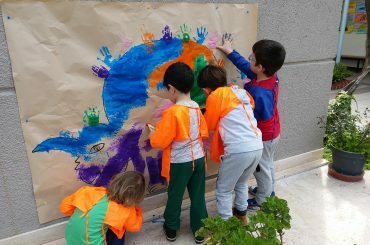 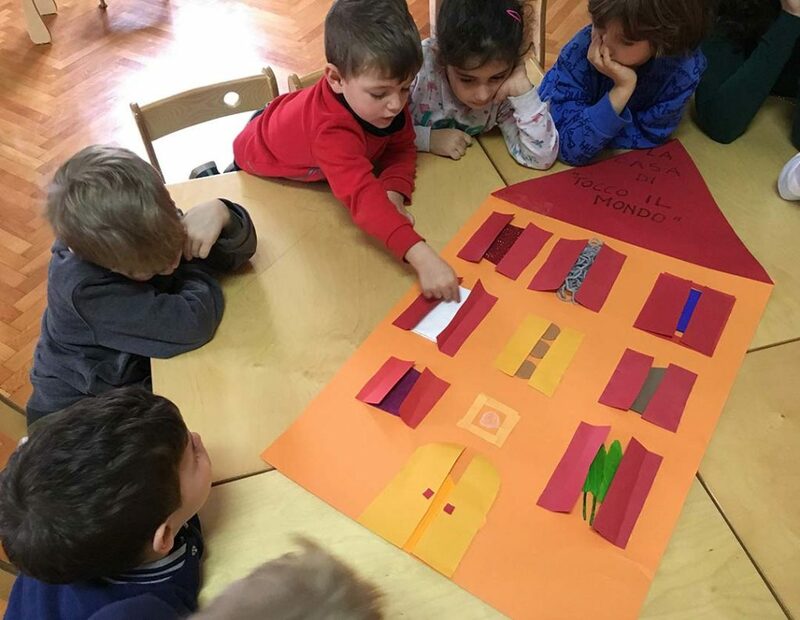 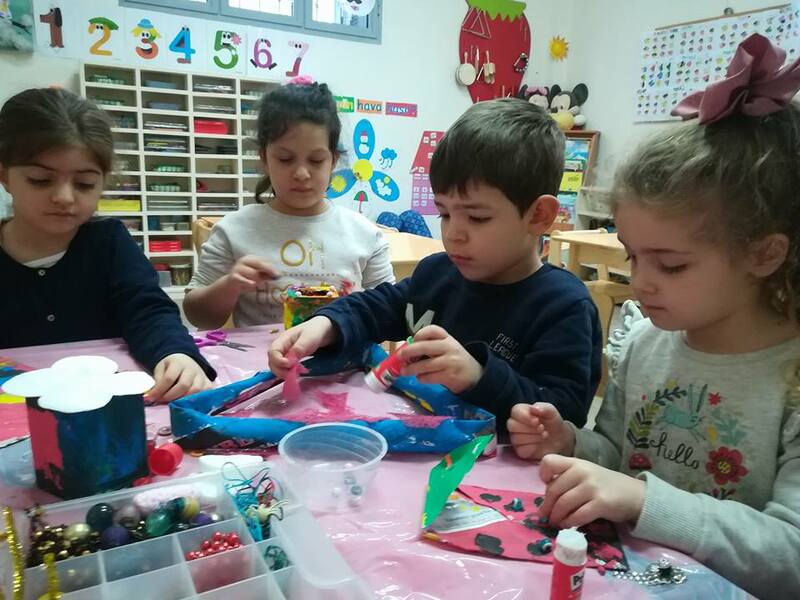 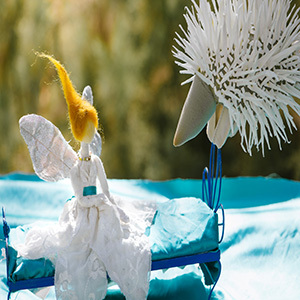 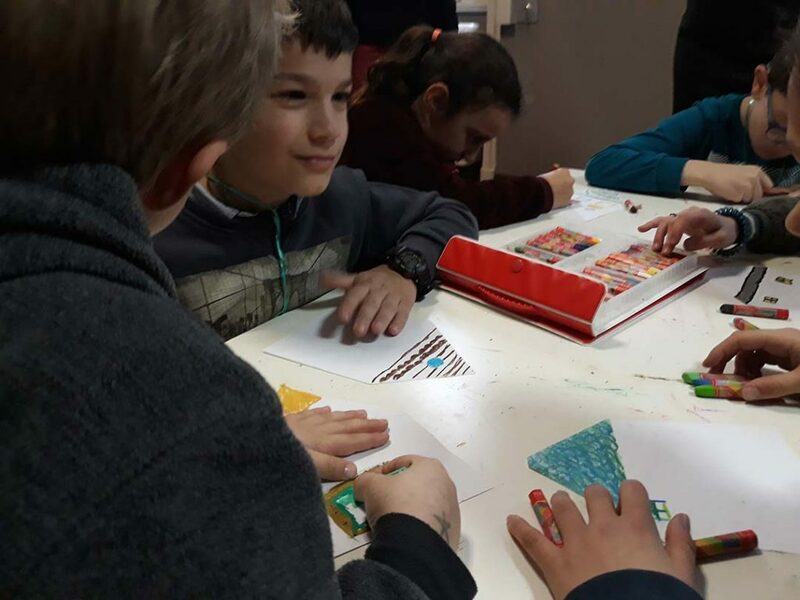 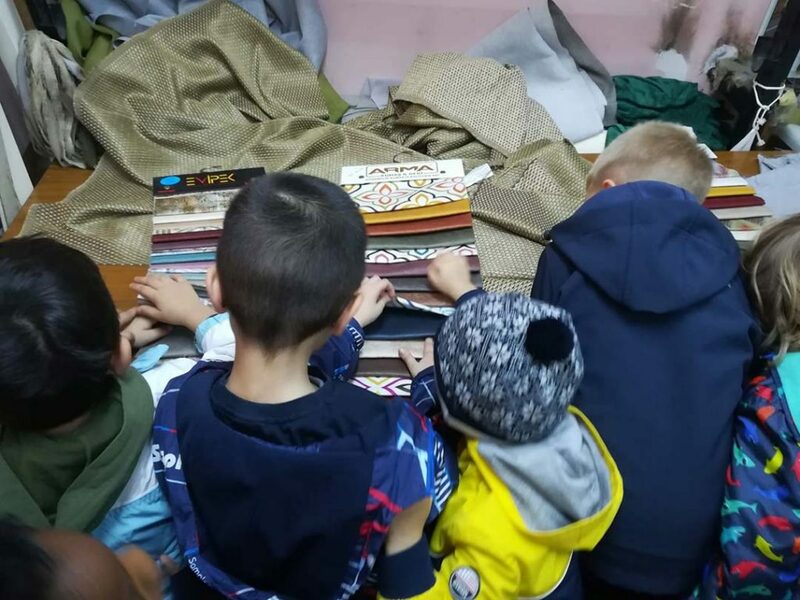 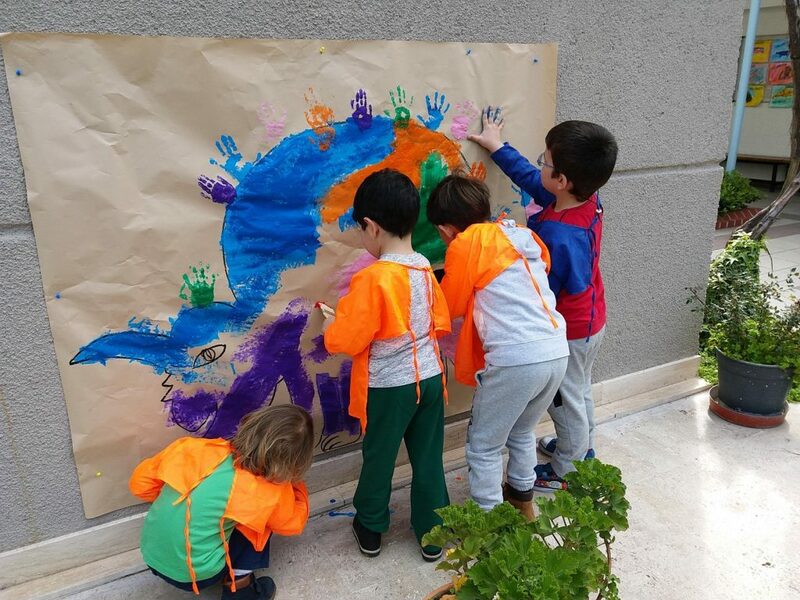 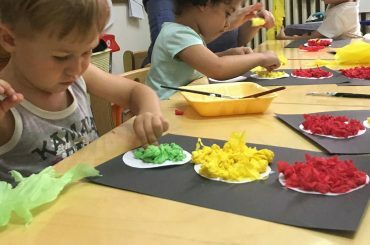 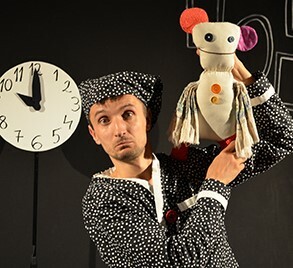 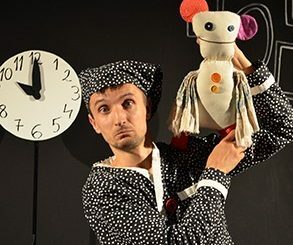 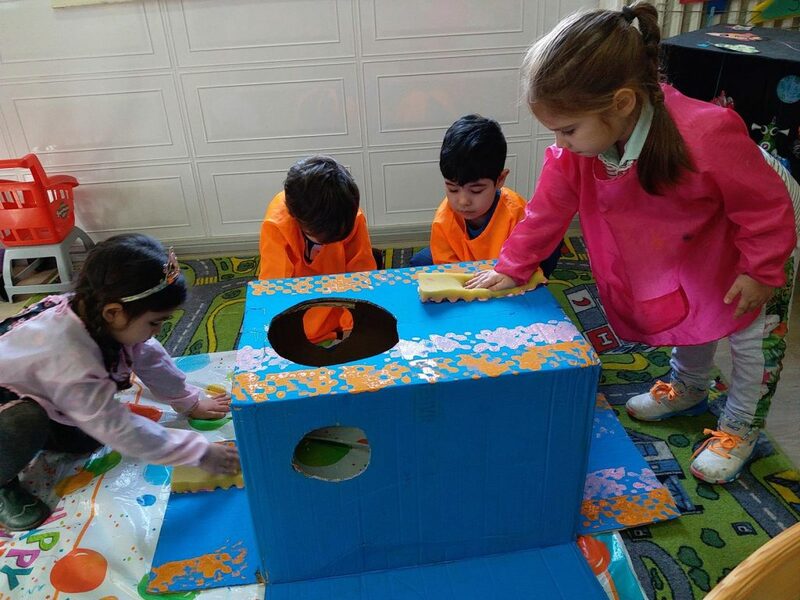 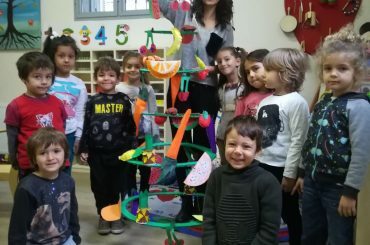 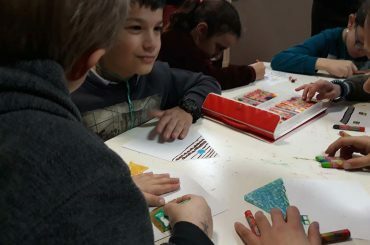 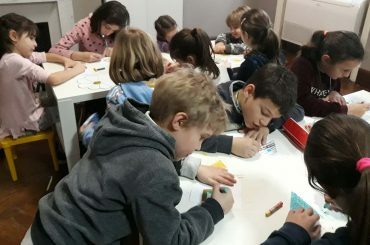 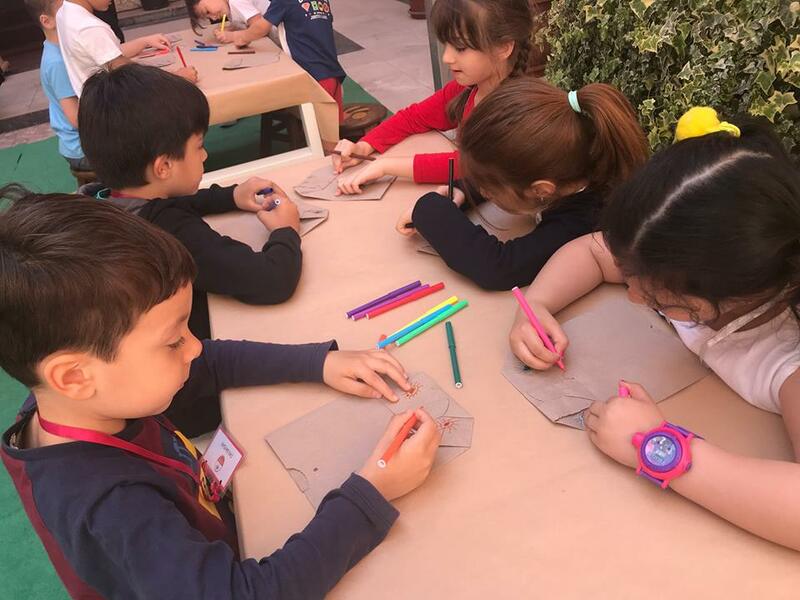 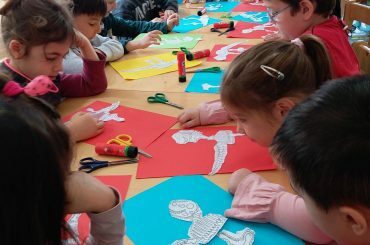 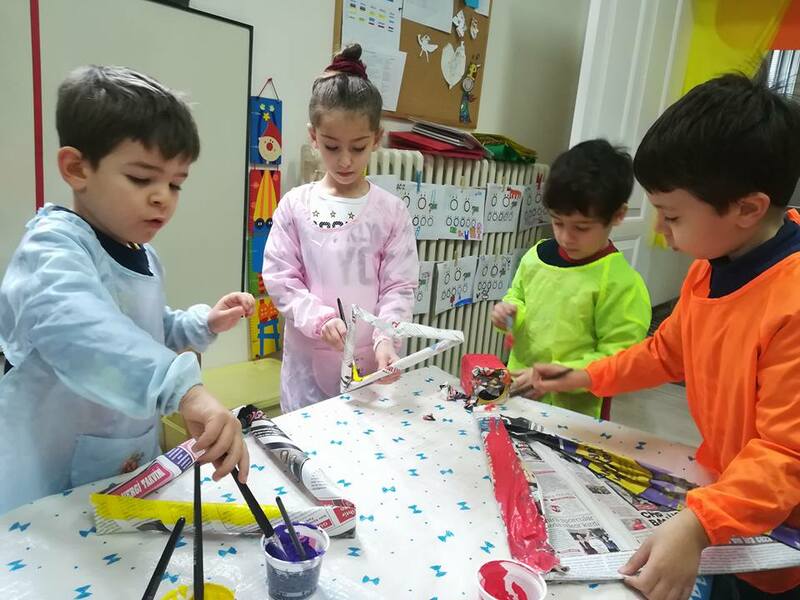 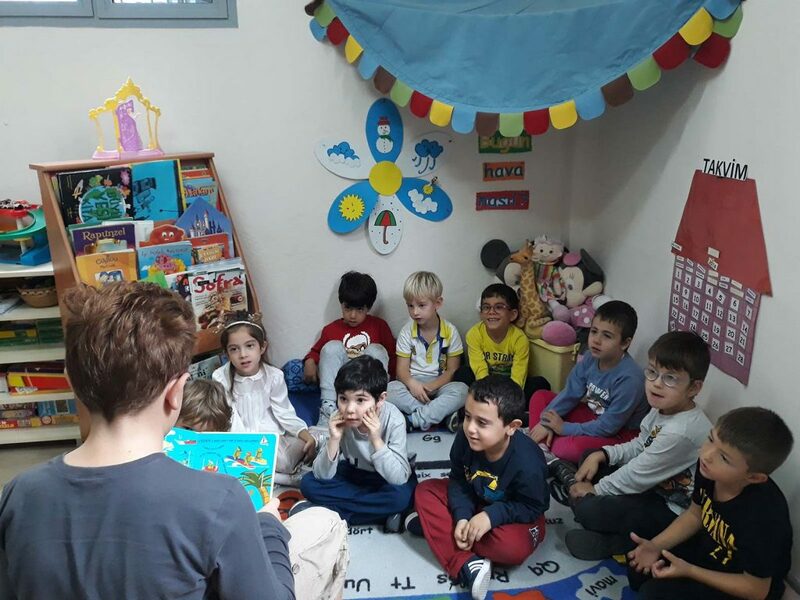 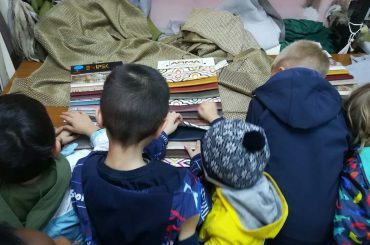 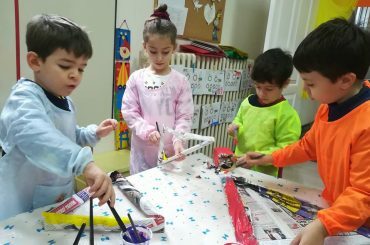 Arkas Sanat Merkezi - "The paintbrush child"
First we listened to a beautiful fairy tale, then with colors, scissors, paper bags and lots of imagination we created our puppets with our little hands. 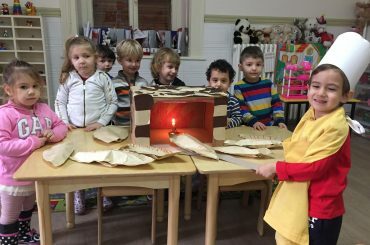 The paper bags turned out in to beautiful puppets! 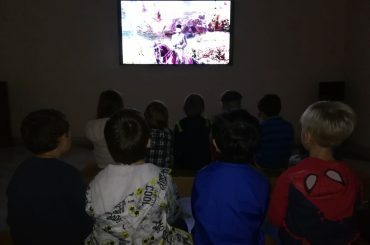 Dinosaurs! 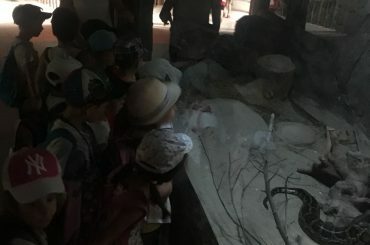 Dinosaurs! 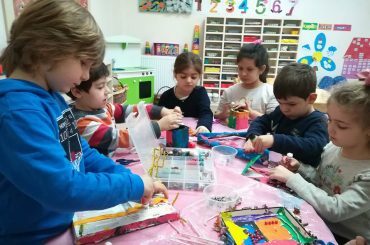 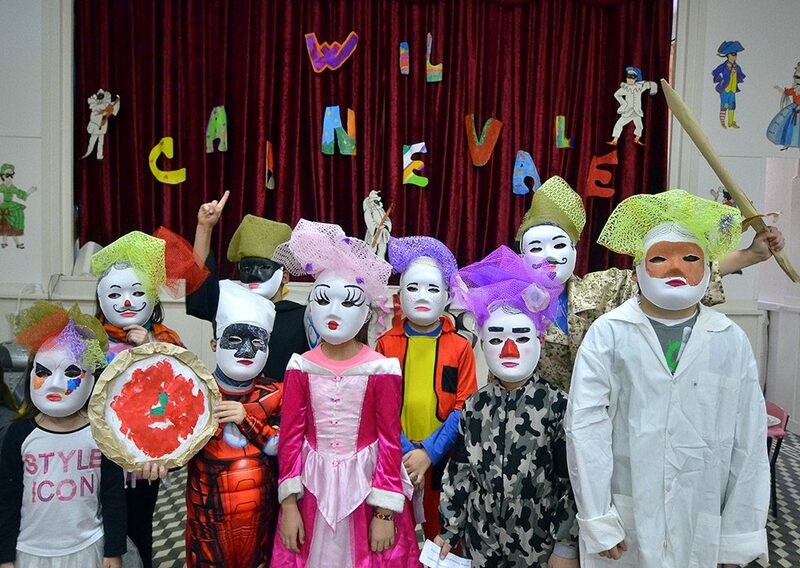 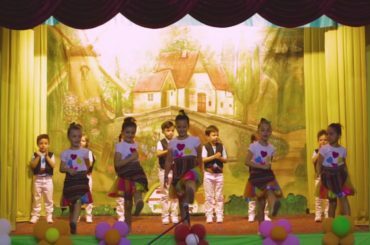 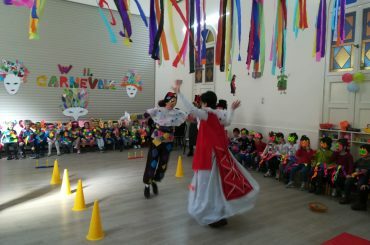 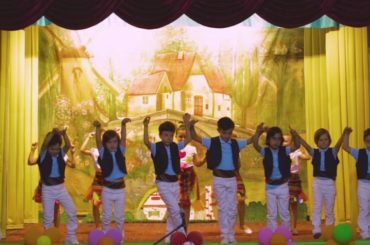 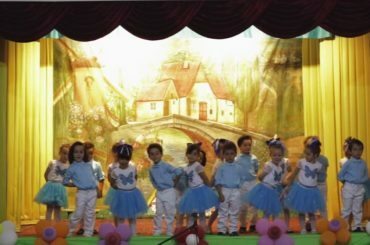 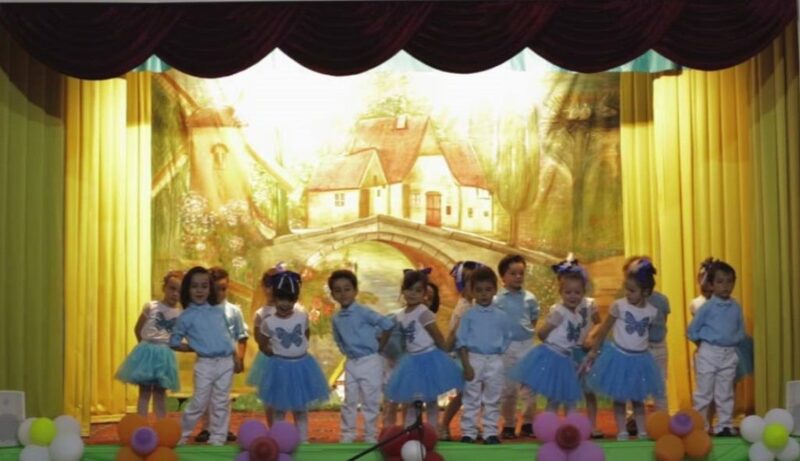 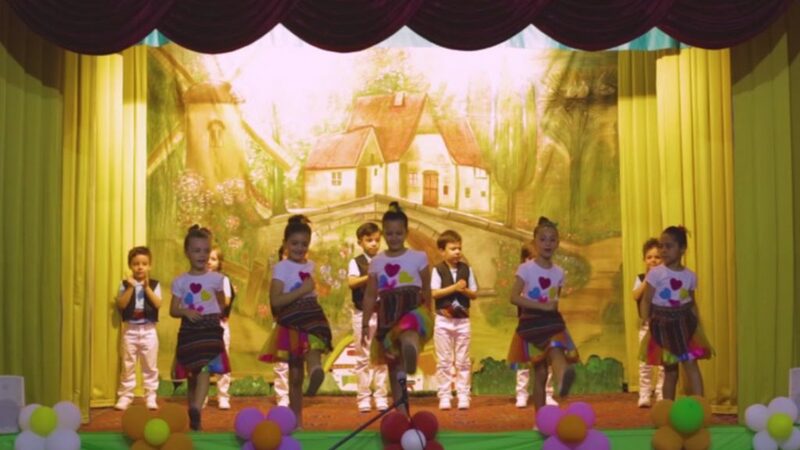 With songs, dramas, activities and experiments we discovered their life and characteristics. 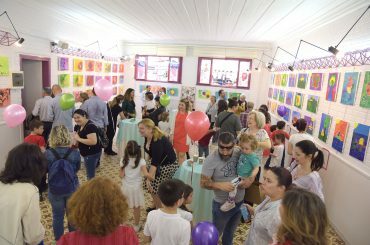 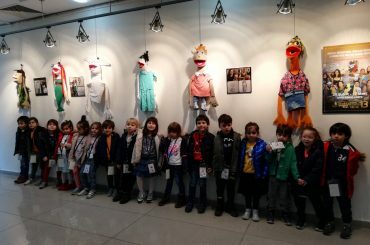 We decided to share our student’s drawings by organizing an exhibition named “Fingerprints” and we also celebrated “Children’s Day”. 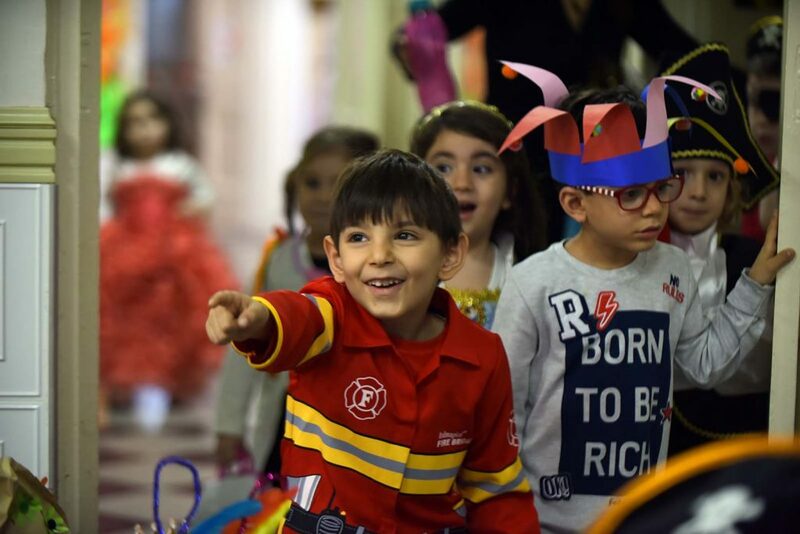 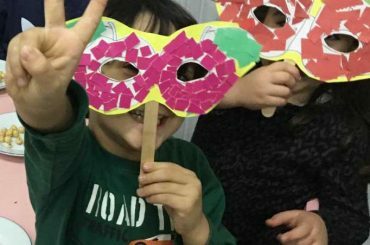 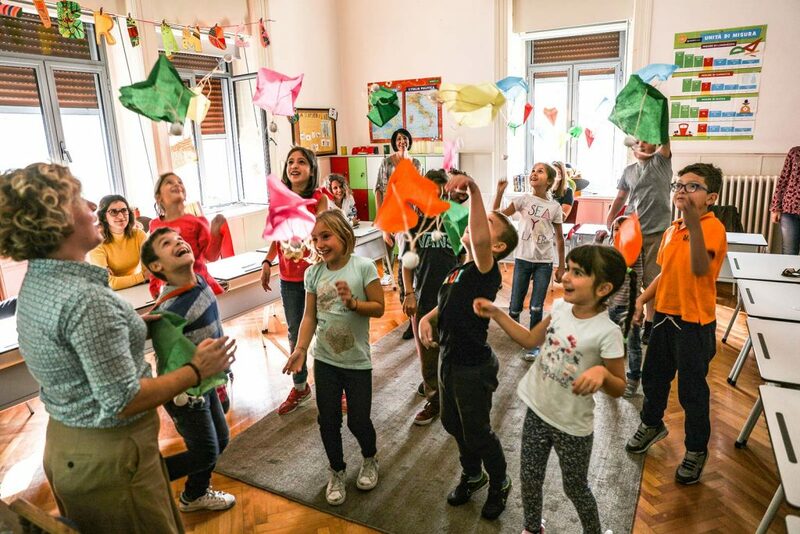 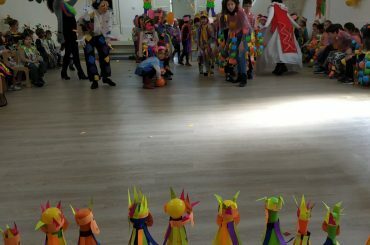 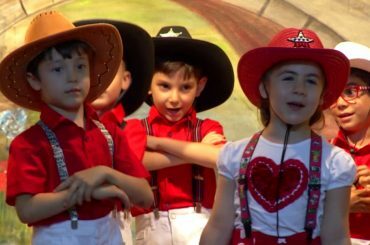 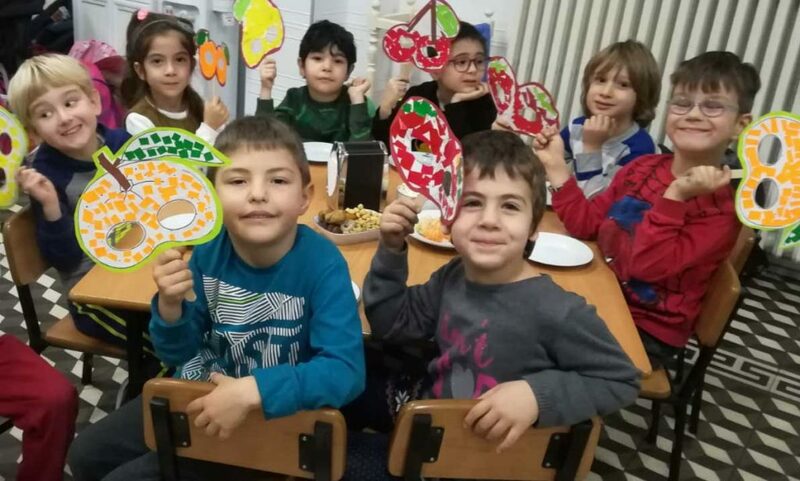 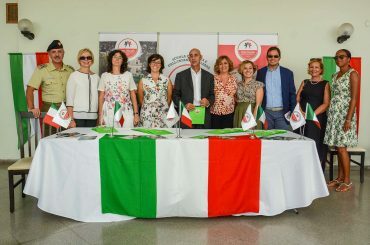 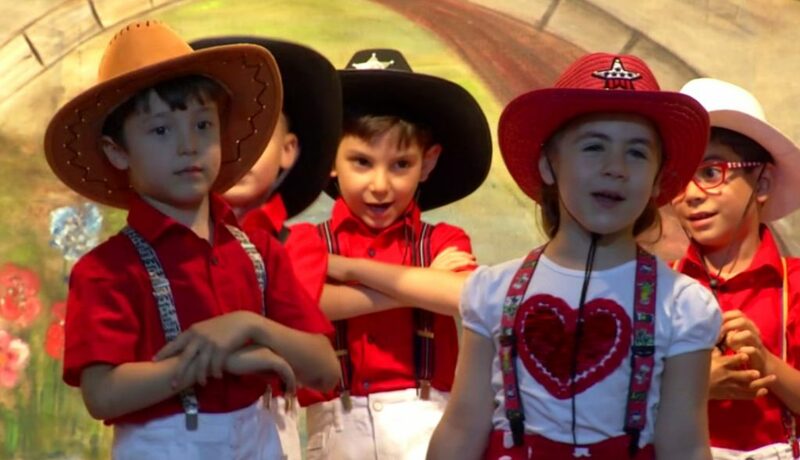 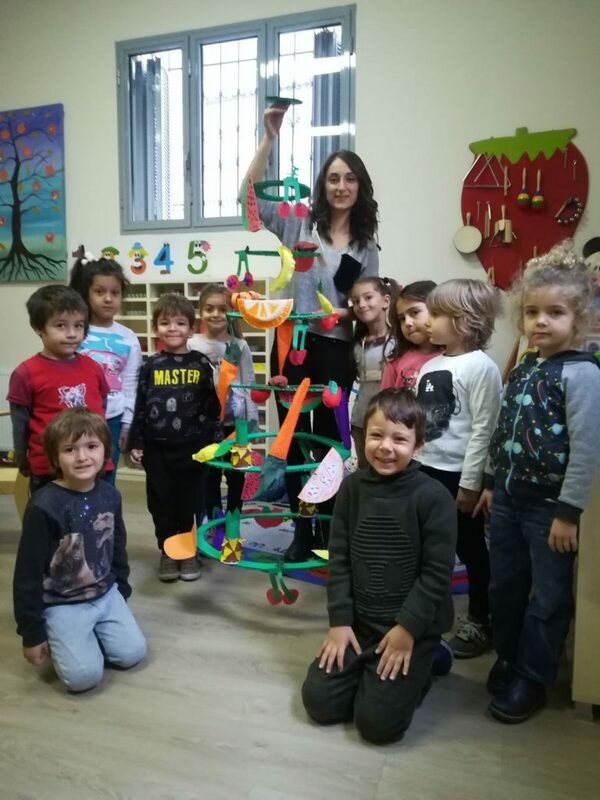 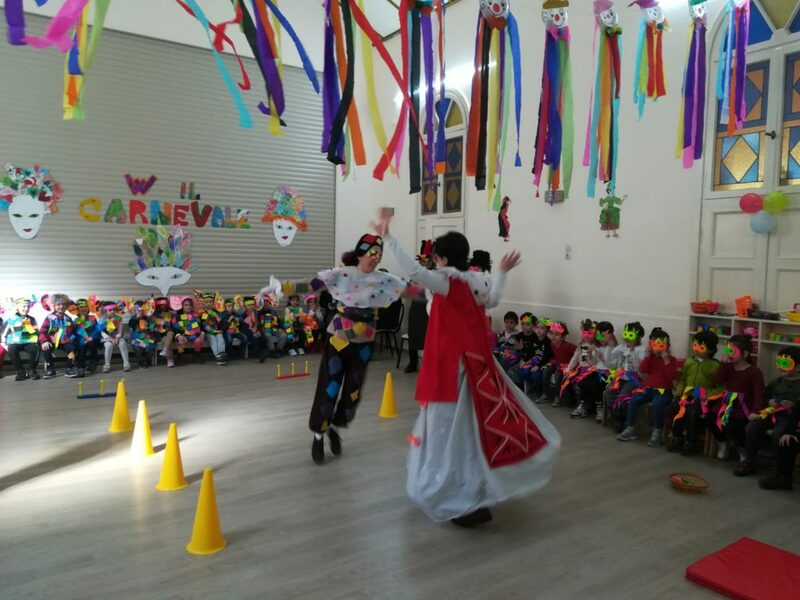 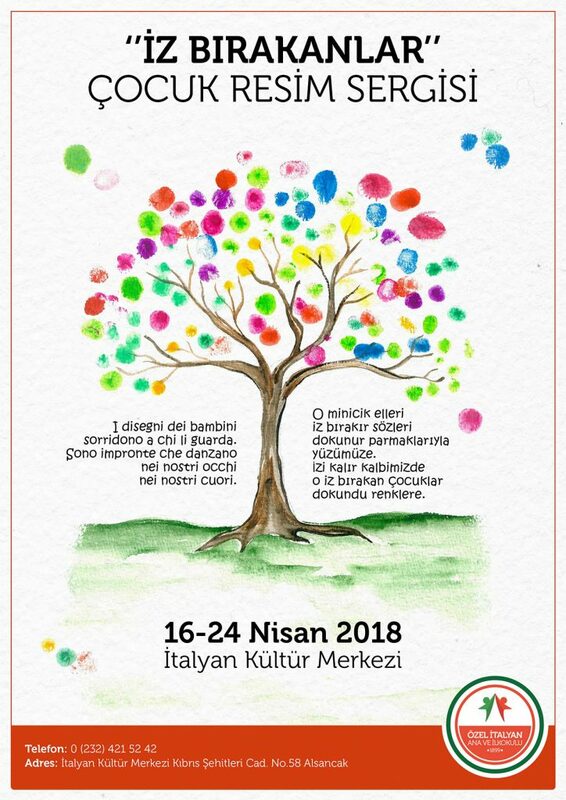 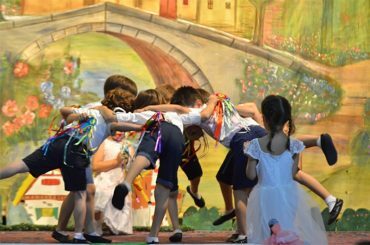 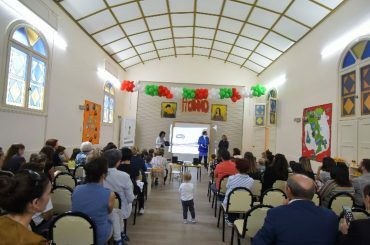 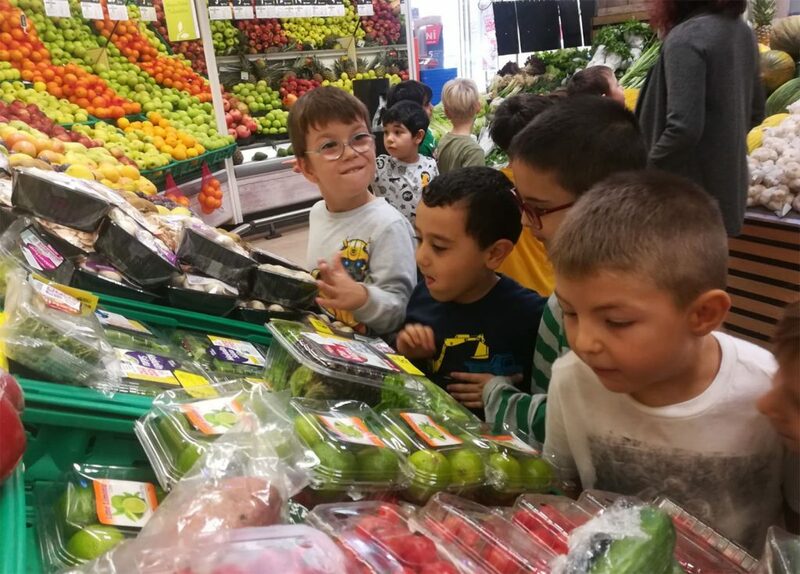 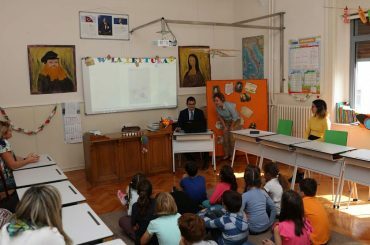 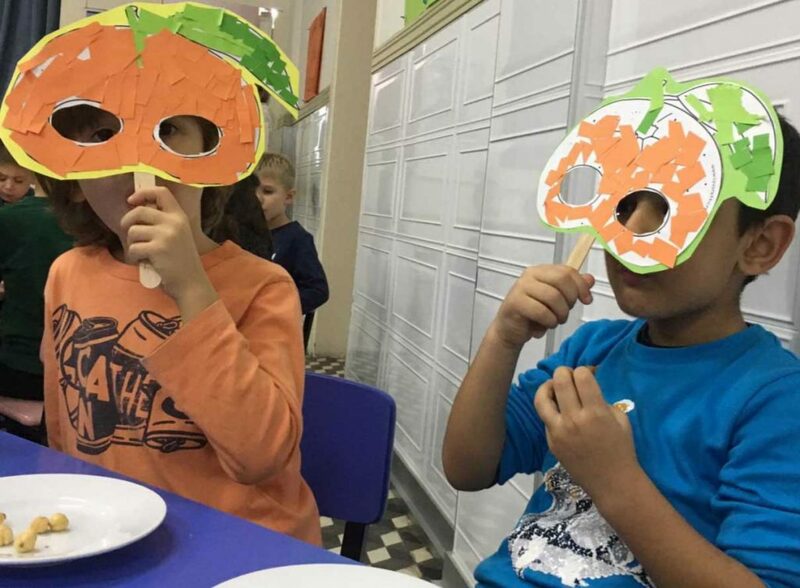 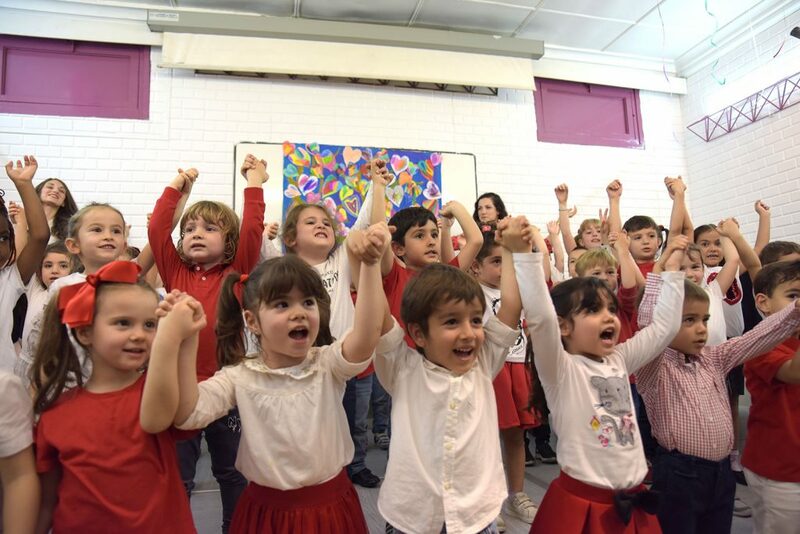 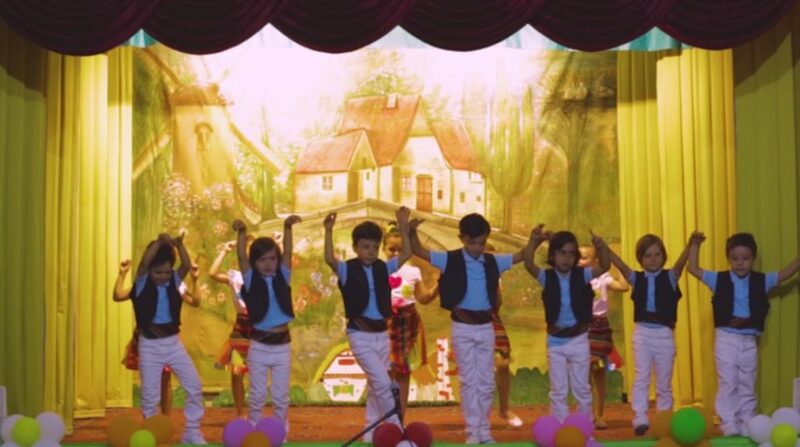 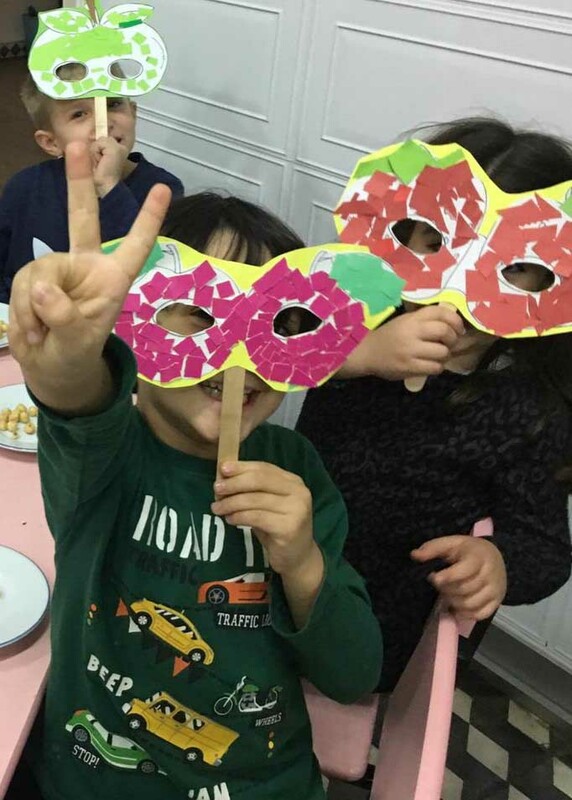 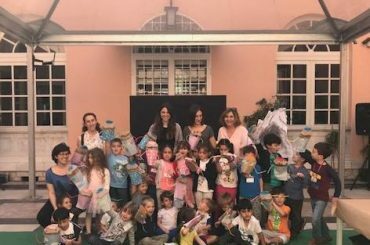 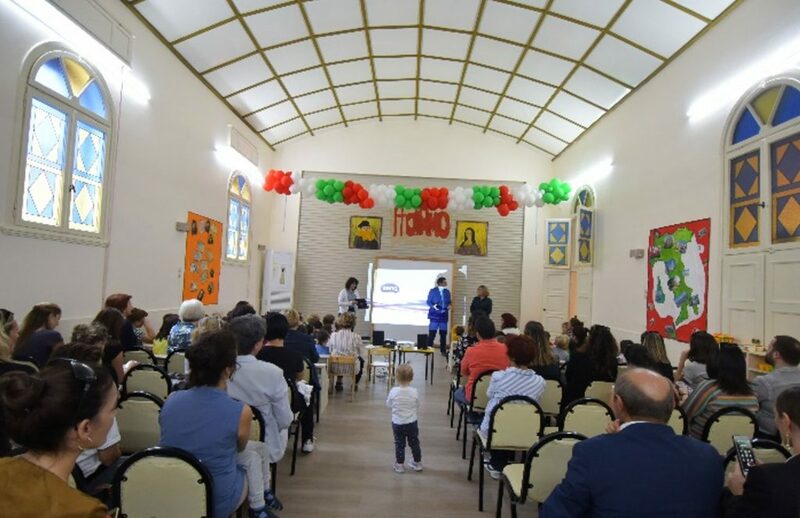 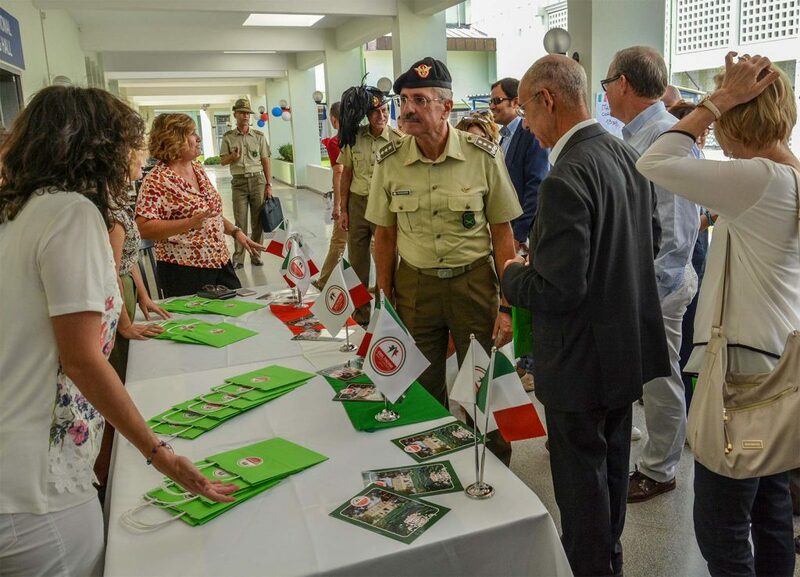 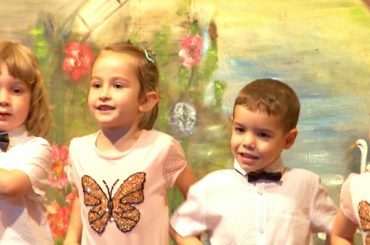 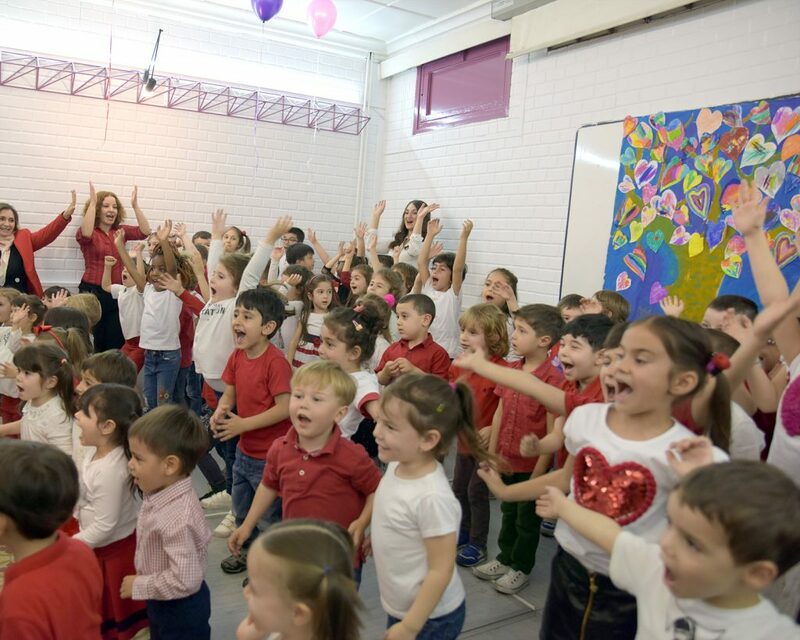 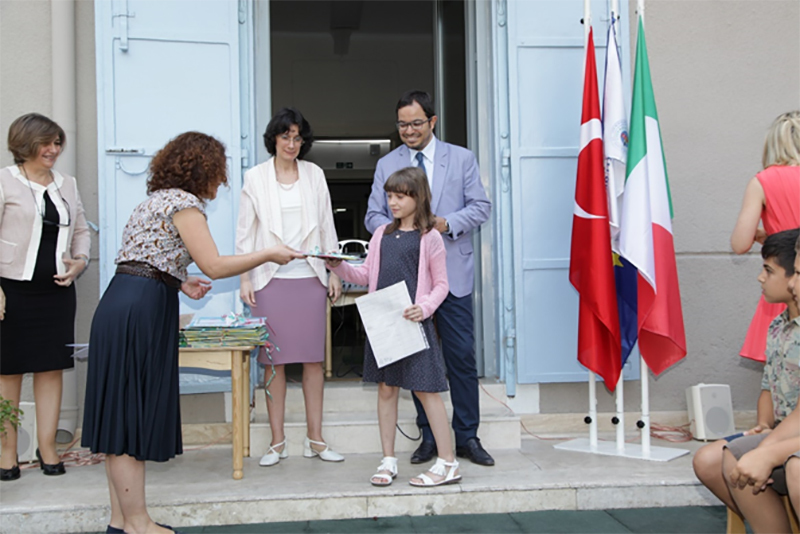 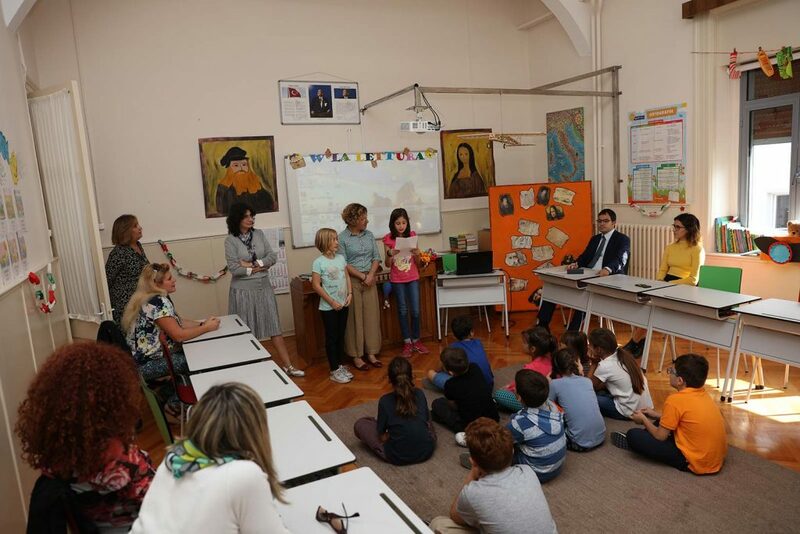 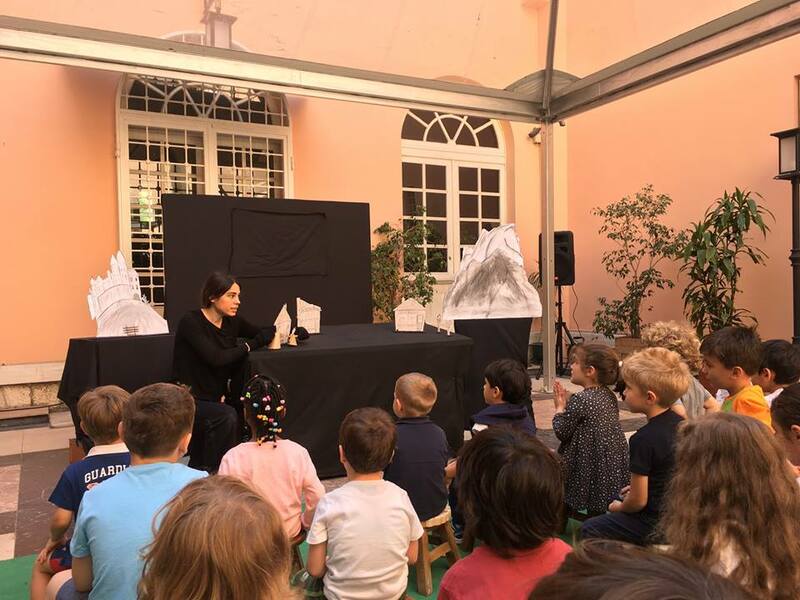 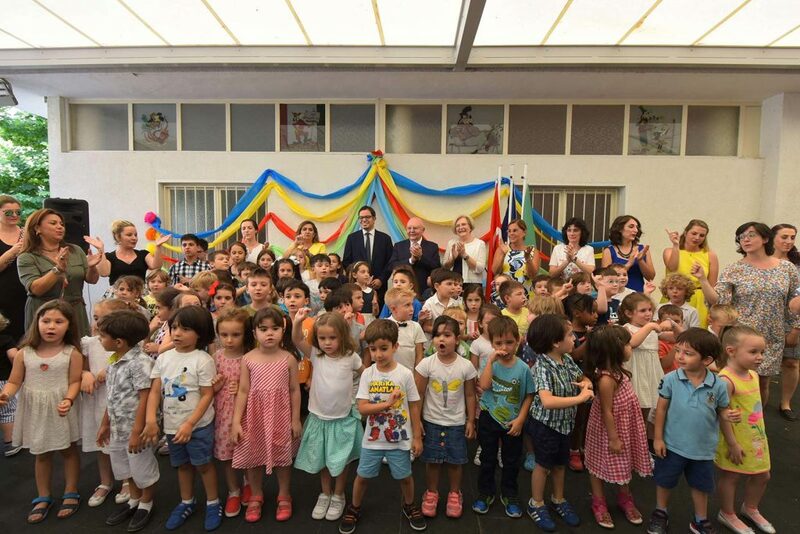 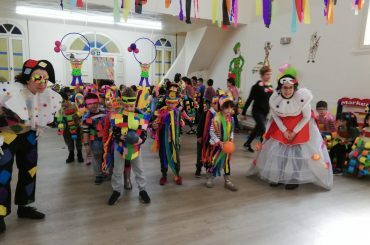 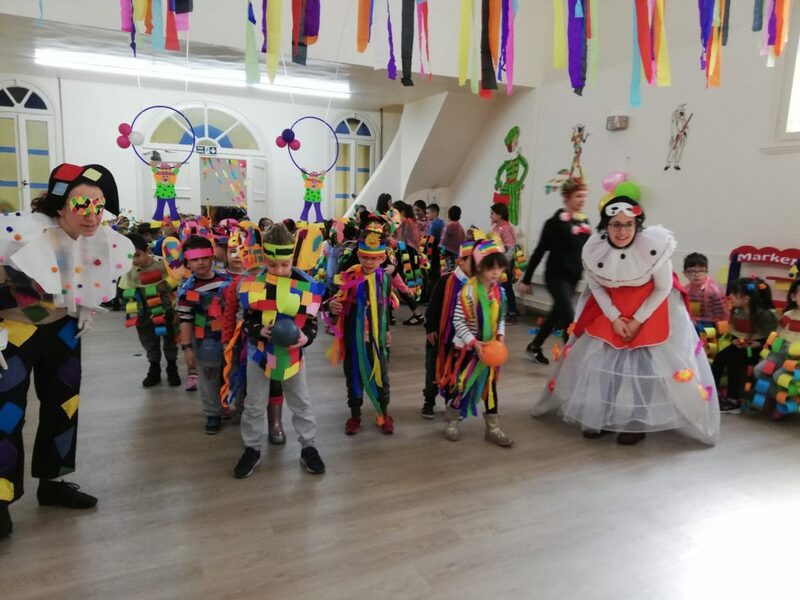 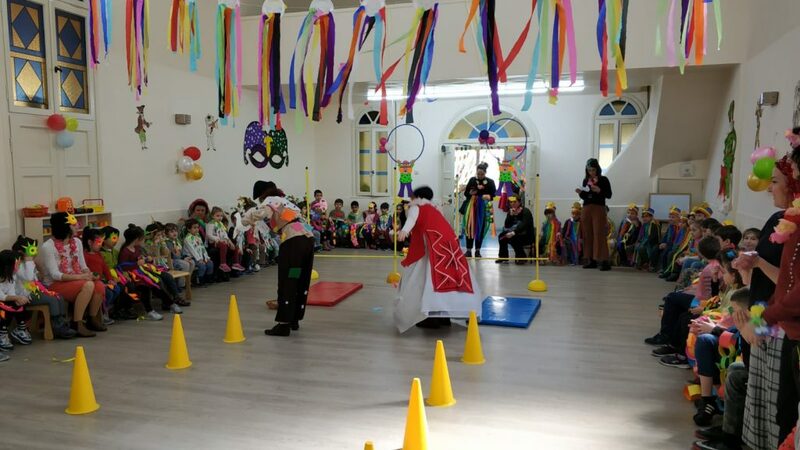 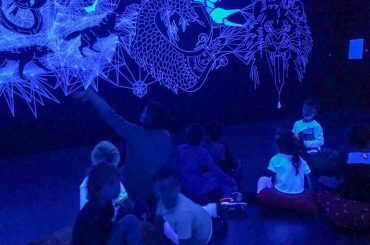 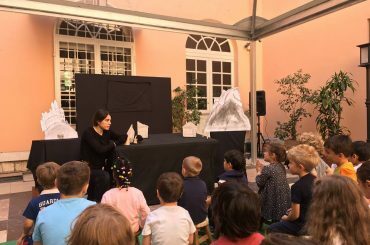 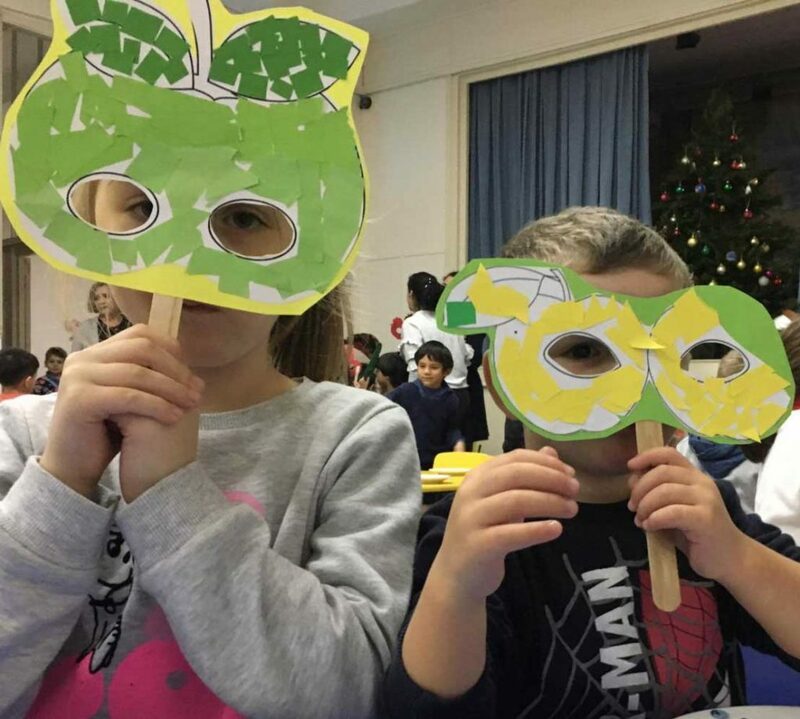 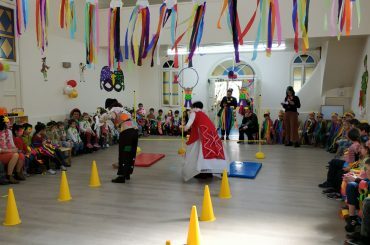 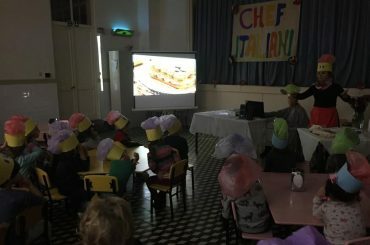 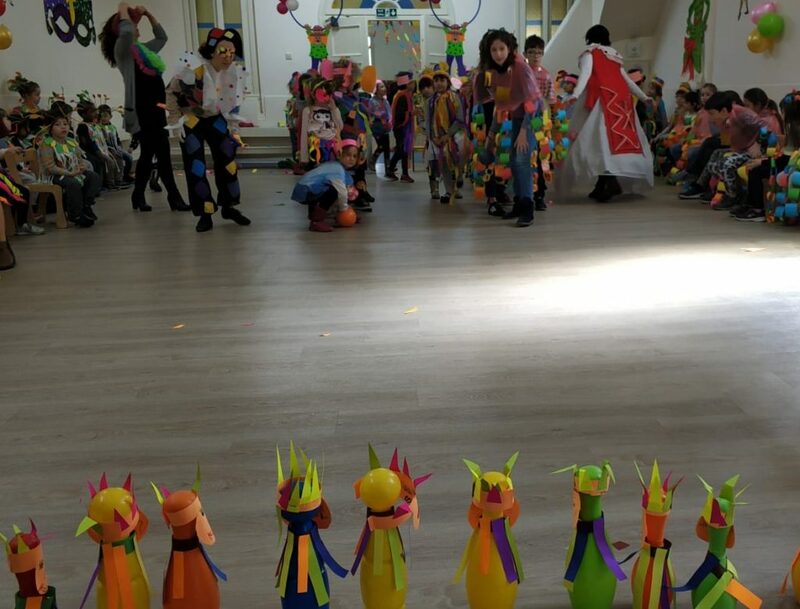 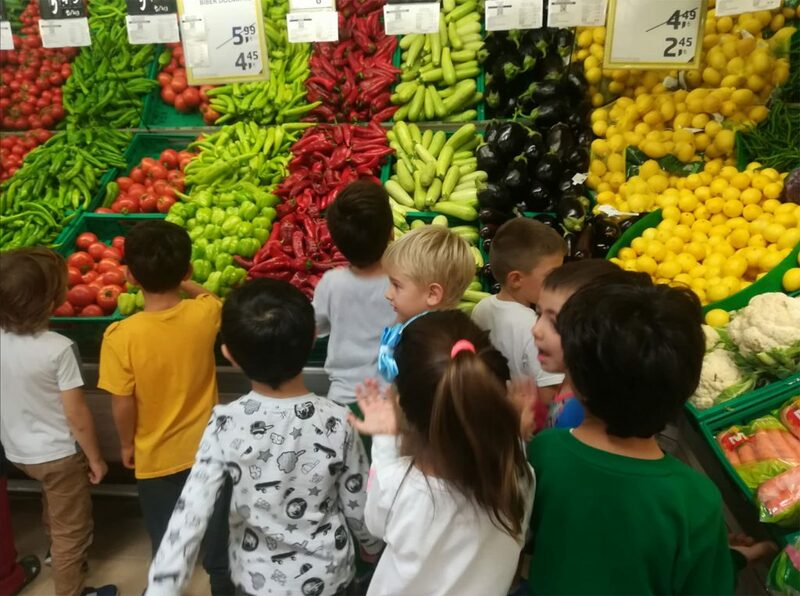 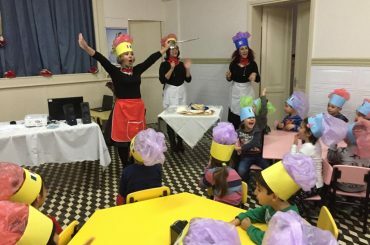 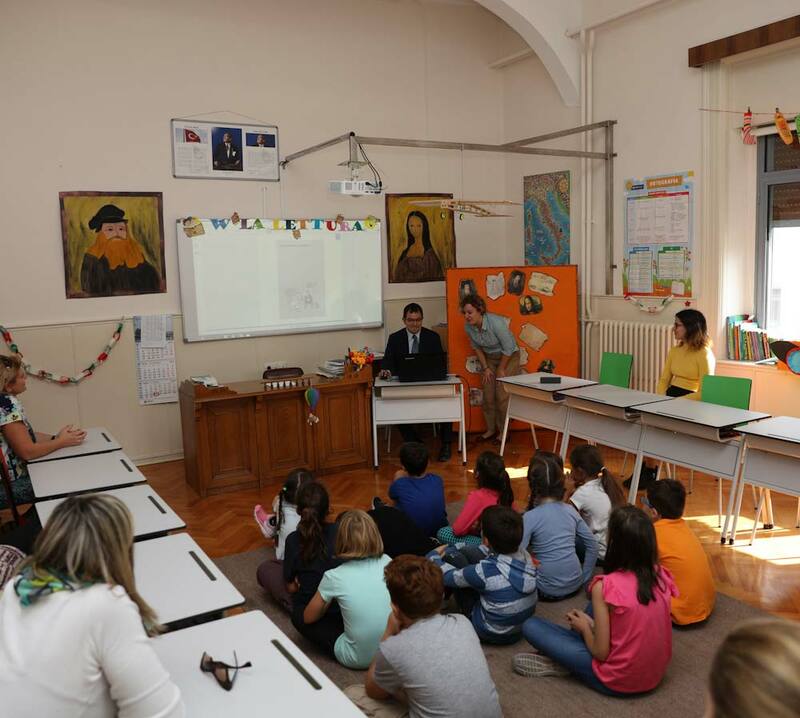 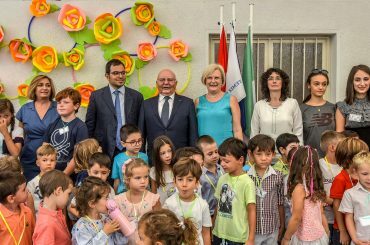 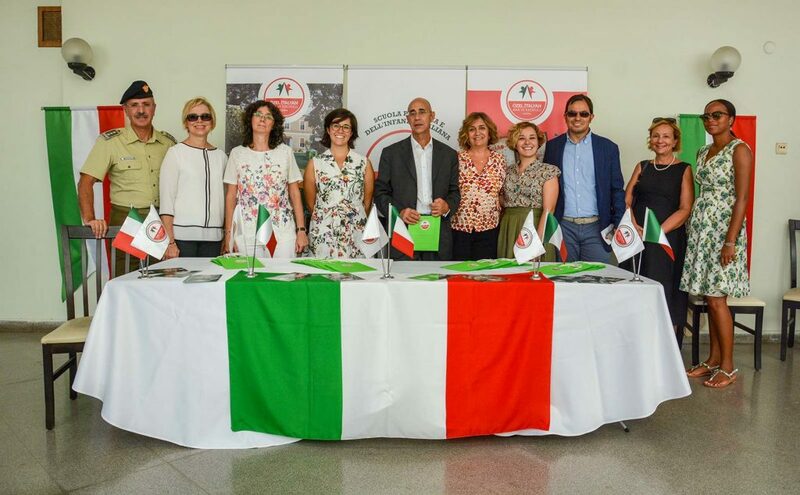 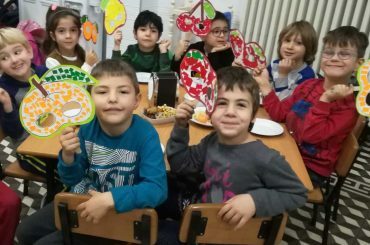 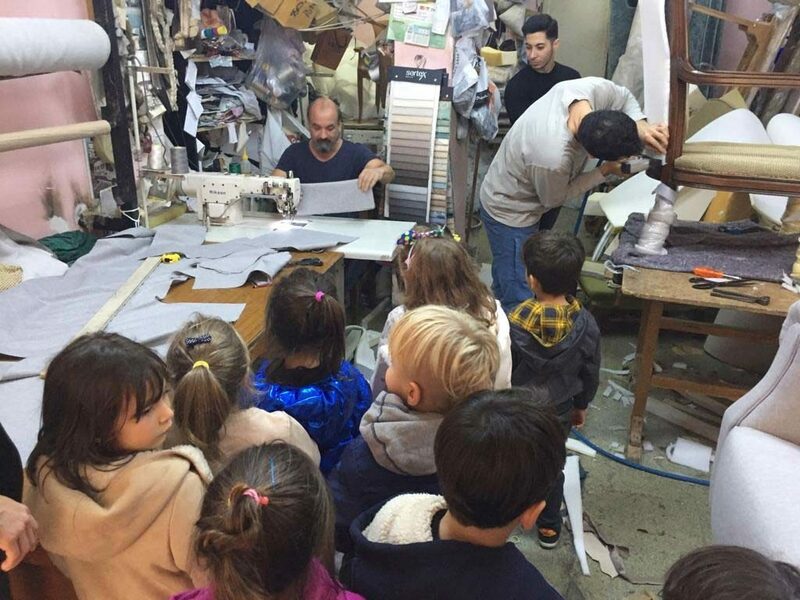 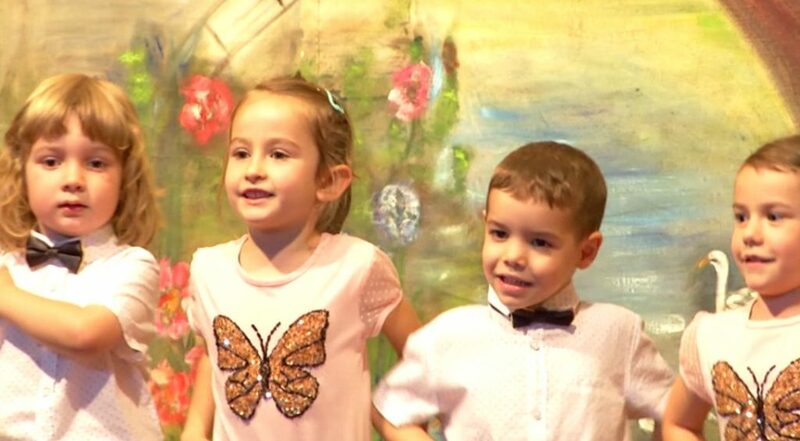 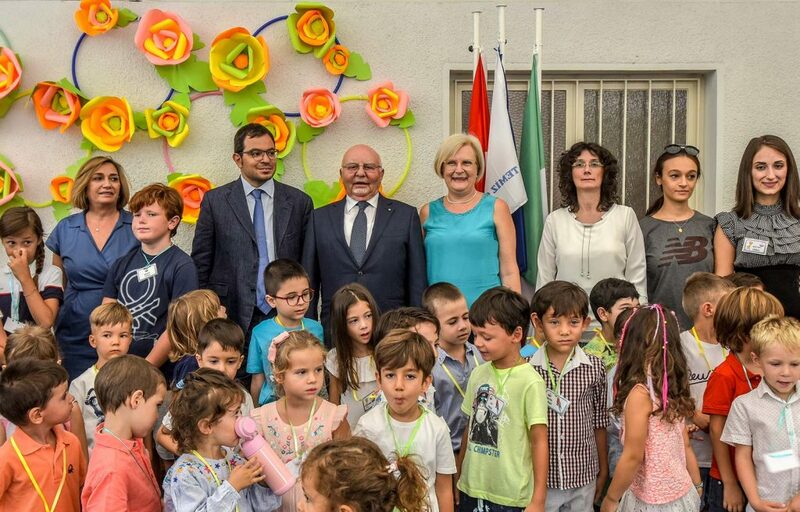 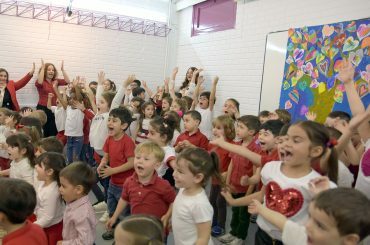 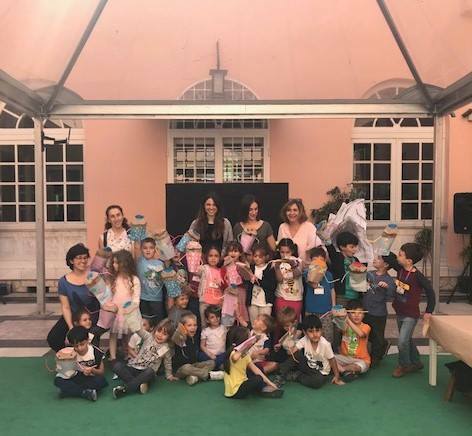 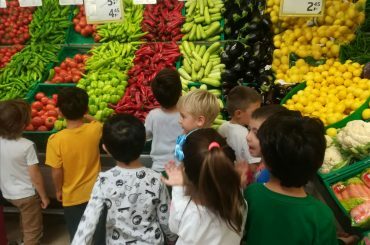 Surrounded by colors, drawings, parents and the Italian Consul of Izmir Luigi Iannuzzi, our students had a lot of fun singing and dancing at the Italian Cultural Center. 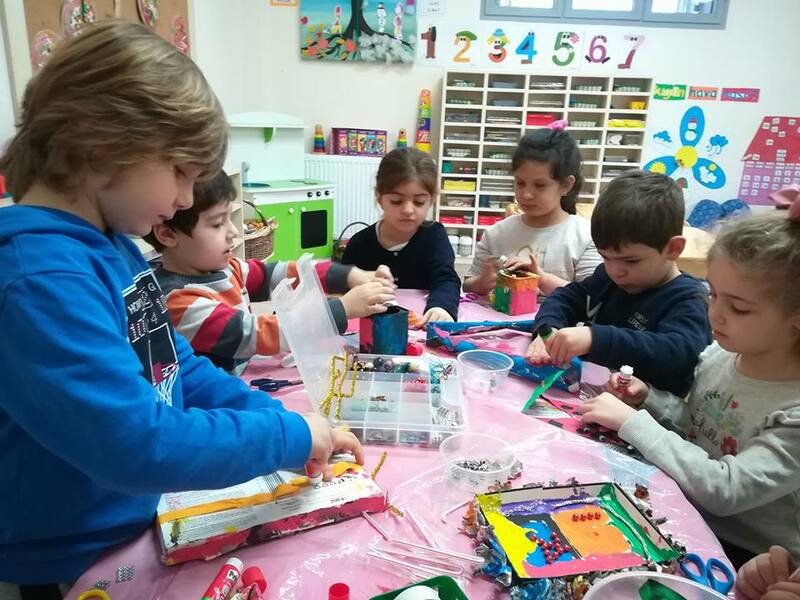 We examined the waste materials and talked about the difference between waste and garbage. 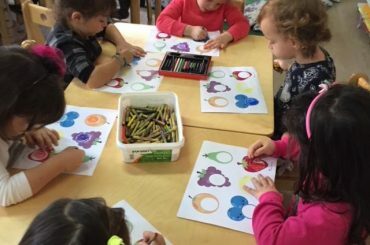 We have drawn and colored with different materials. 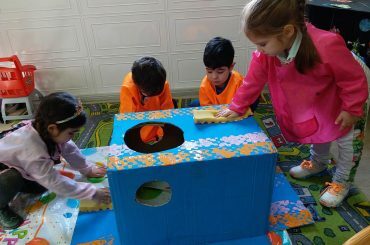 We remind the importance of recycling. 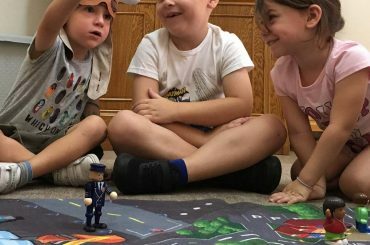 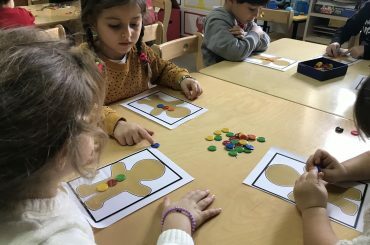 We had so much fun with the cookie-man: he helped us to learn mathematics, manual skills, and the language of social development. 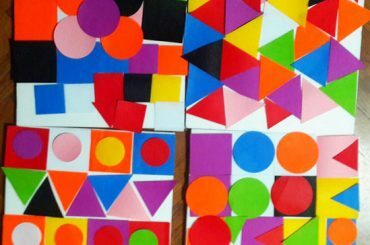 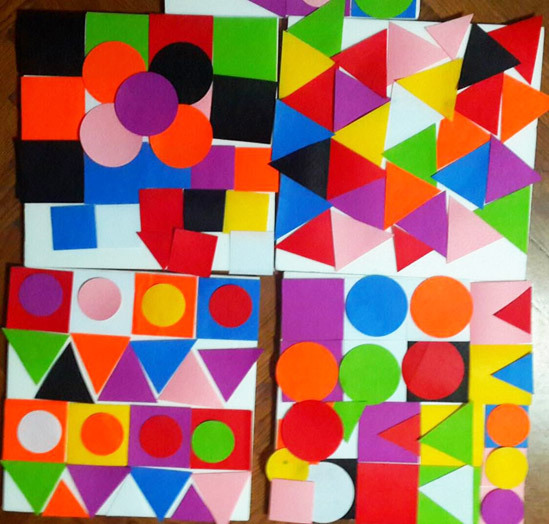 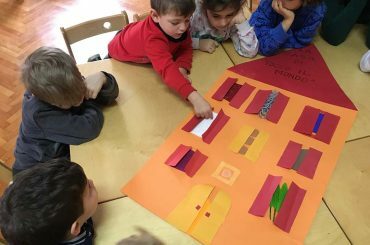 With our teachers we learned to recognise the forms and we noticed that around us there are so many: stars, hearts, squares, triangles..! 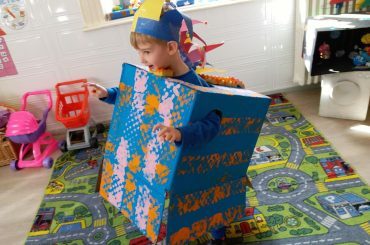 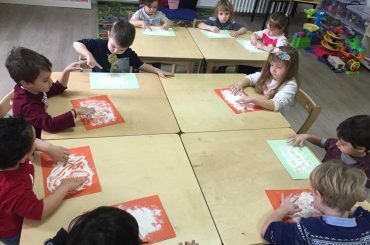 We had lots of fun trying to recreate them with different materials. 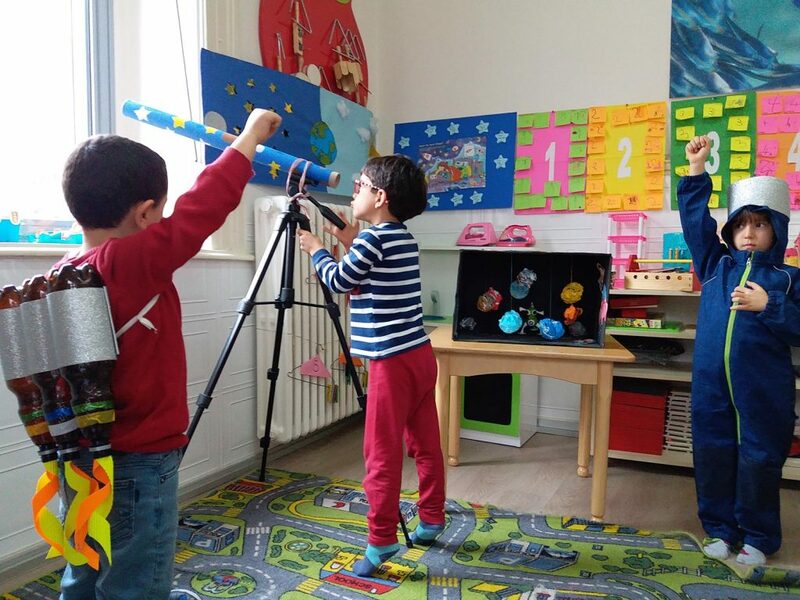 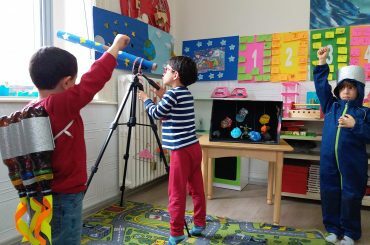 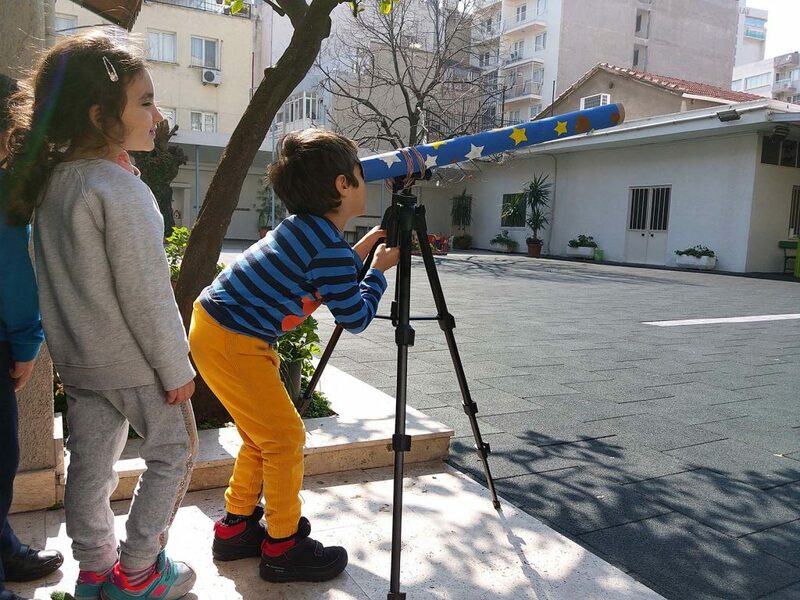 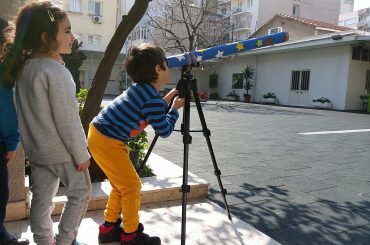 Thanks to this project we have created our telescope and examined the sky. 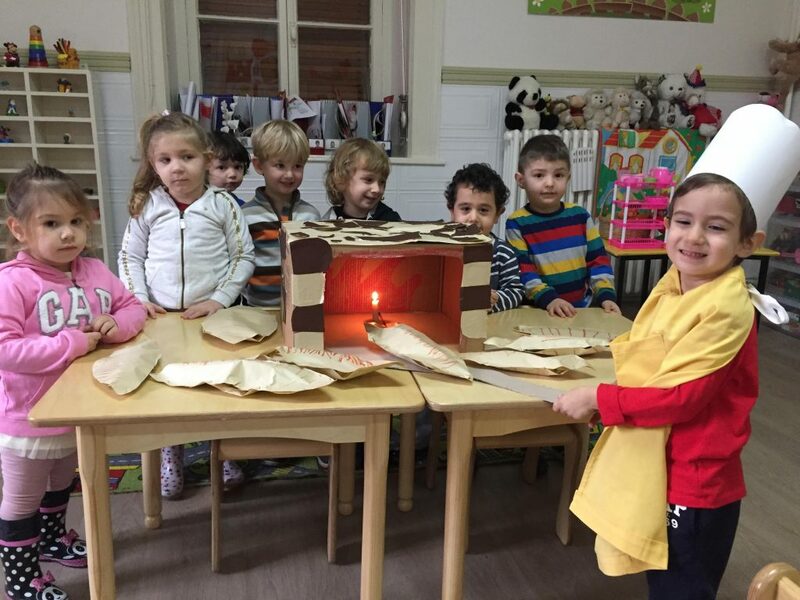 After having dramatized the formation of day and night, we have completed our activity. 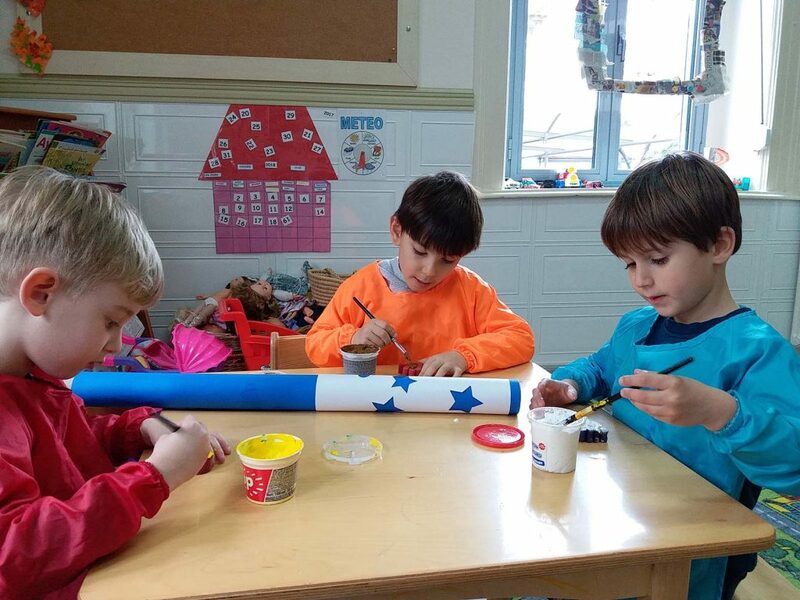 Finally, we created our spaceship, we became astronauts and we went into the space. 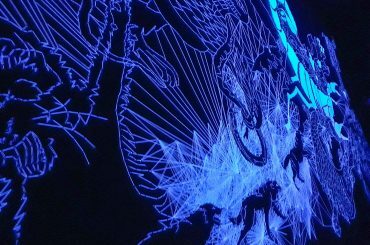 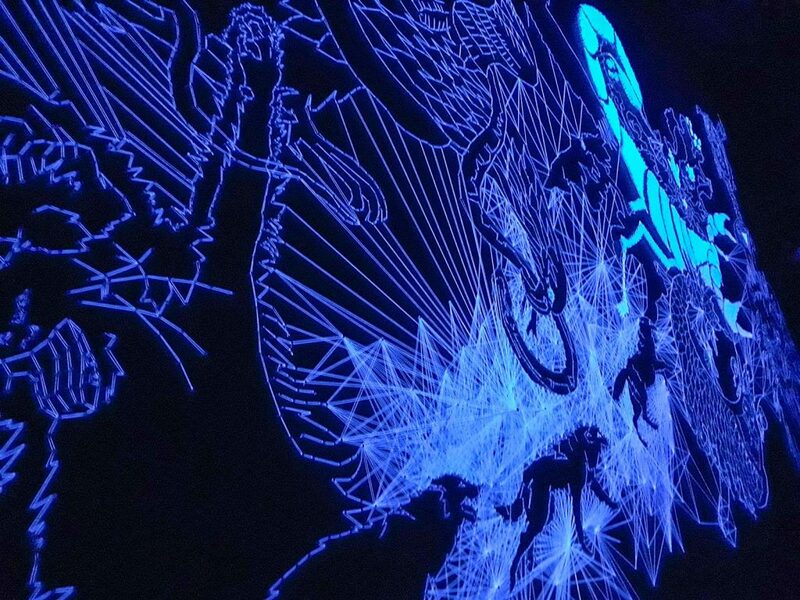 We visited the “Landscapes of Water exhibition” at the Arkas Art Center. 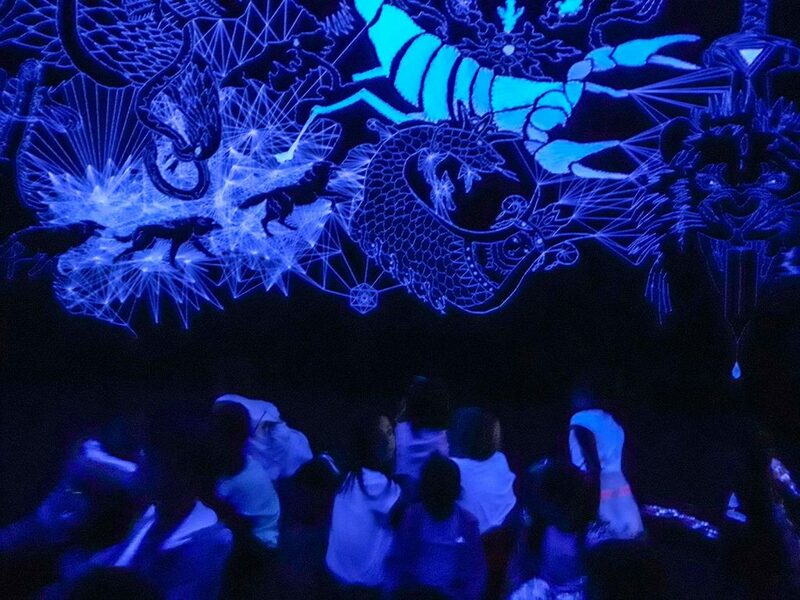 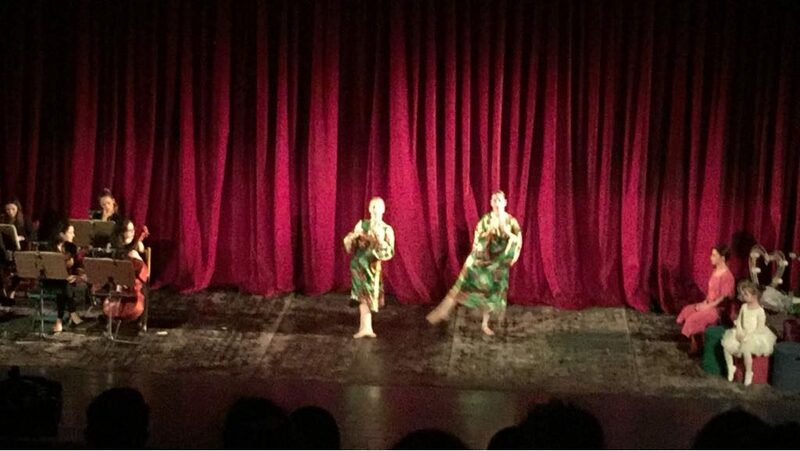 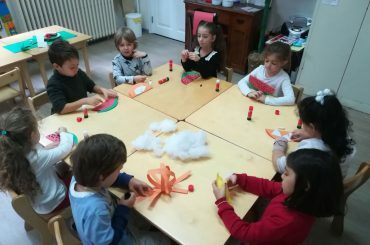 While listening to music we closed our eyes dreamed about the landscapes and we enjoyed producing our own works. 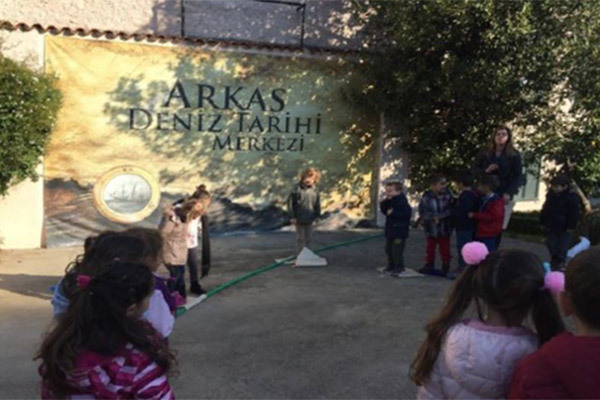 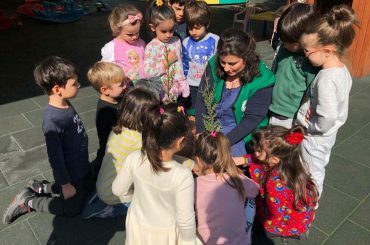 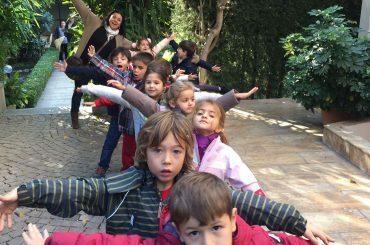 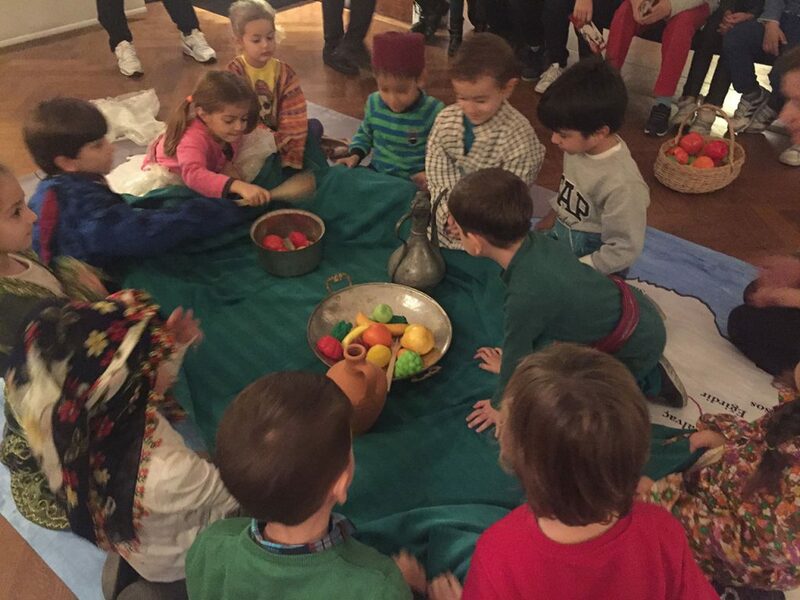 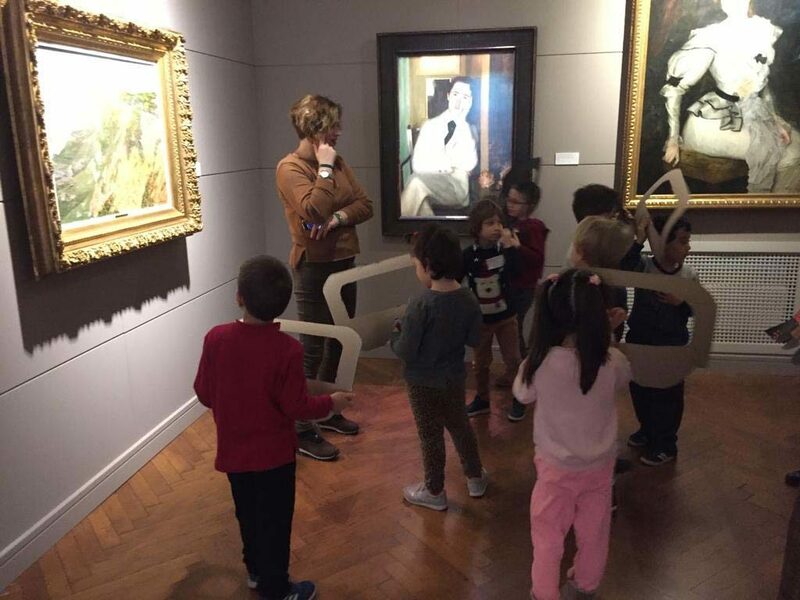 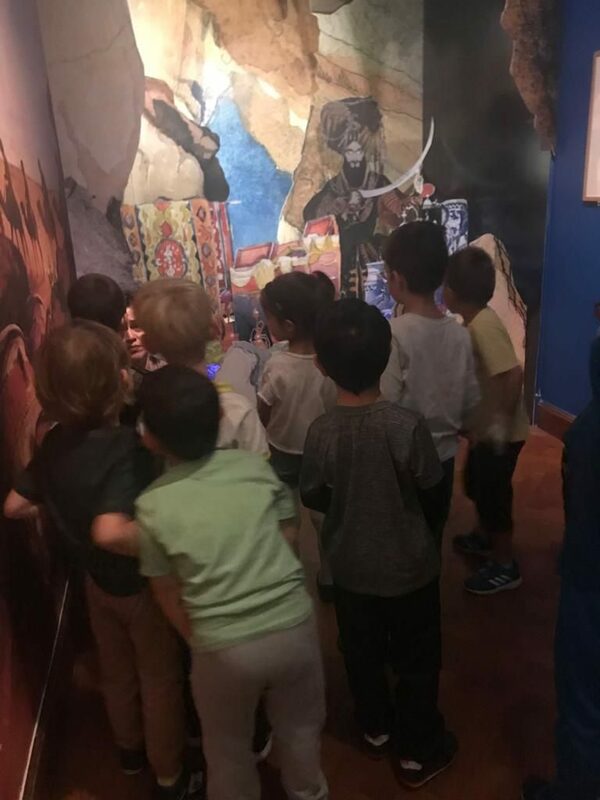 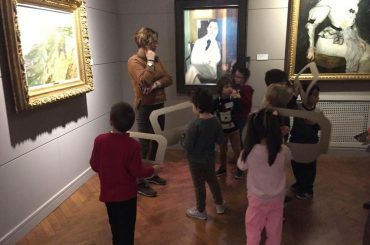 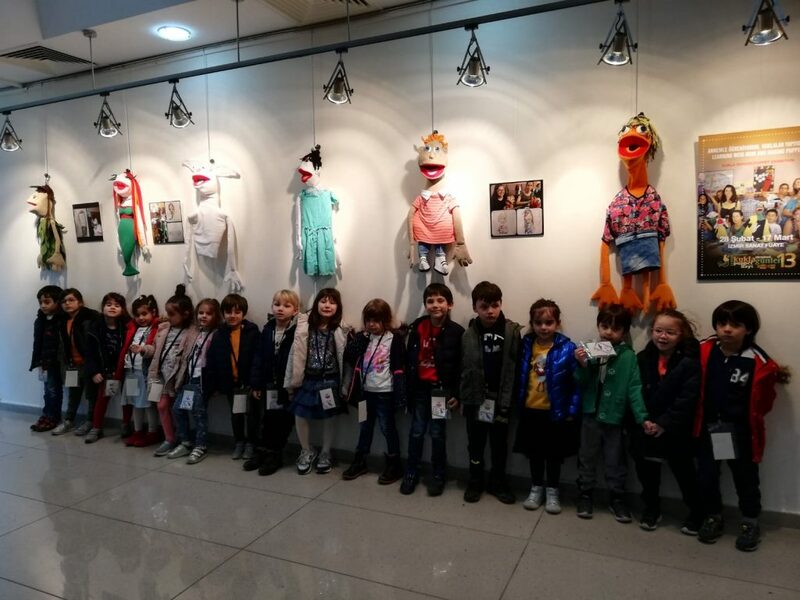 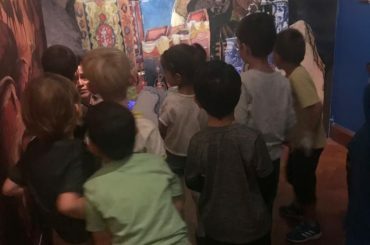 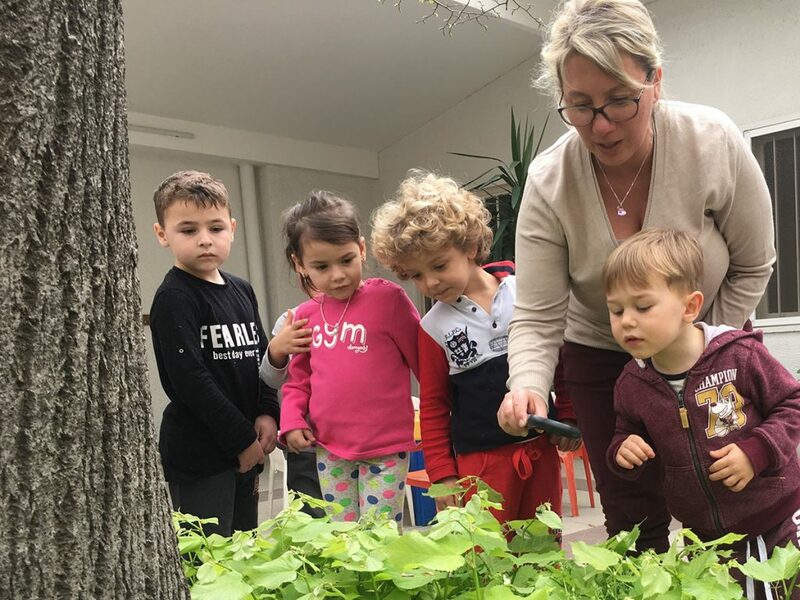 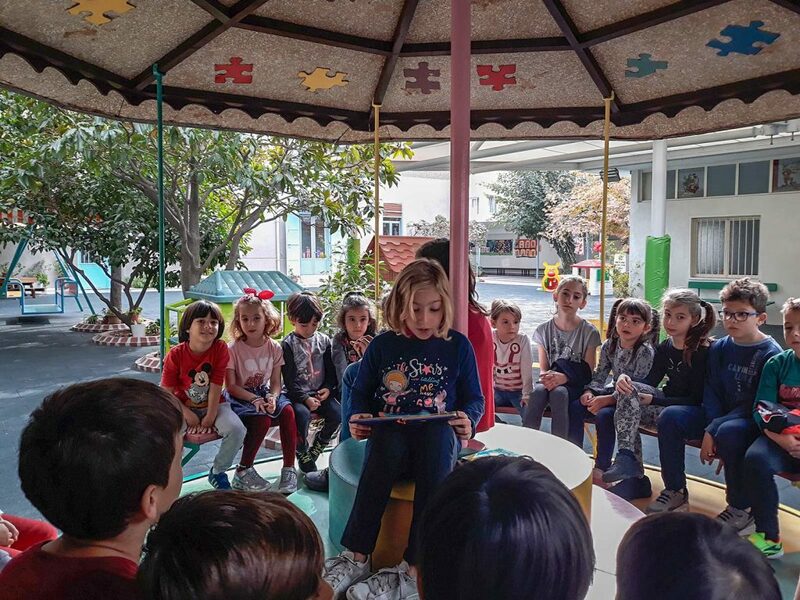 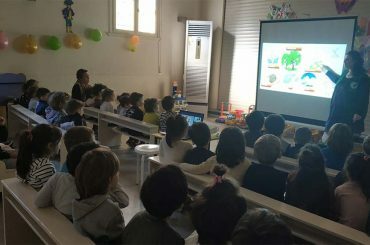 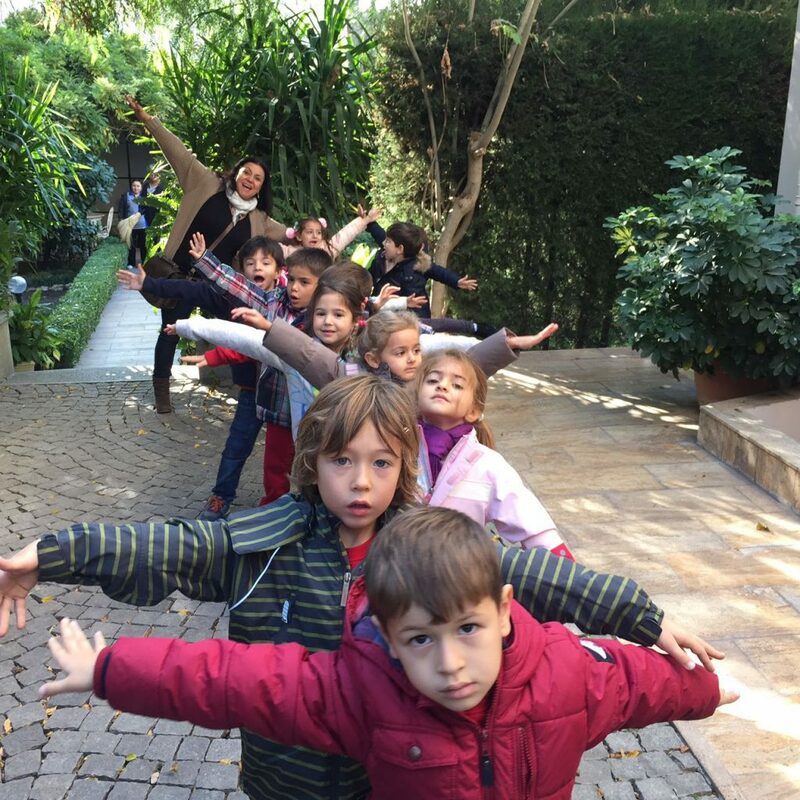 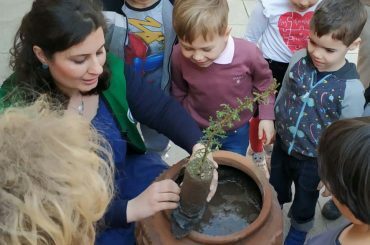 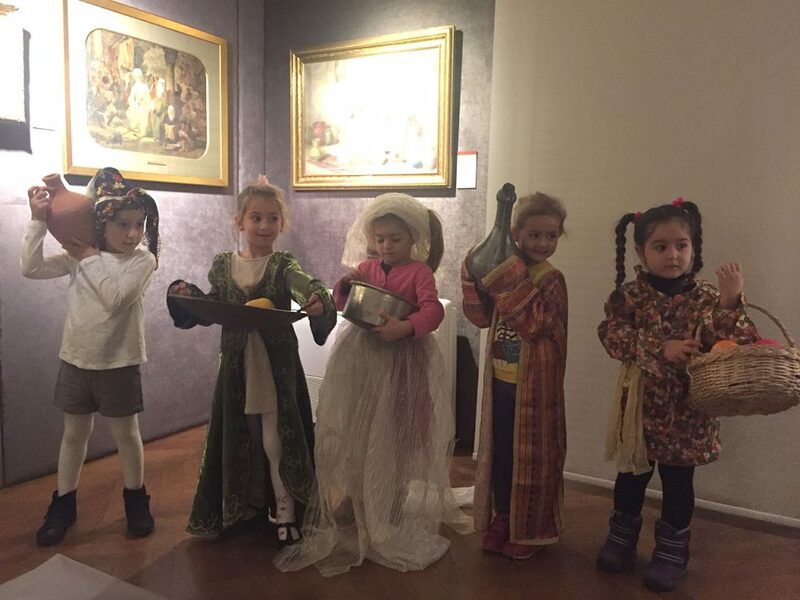 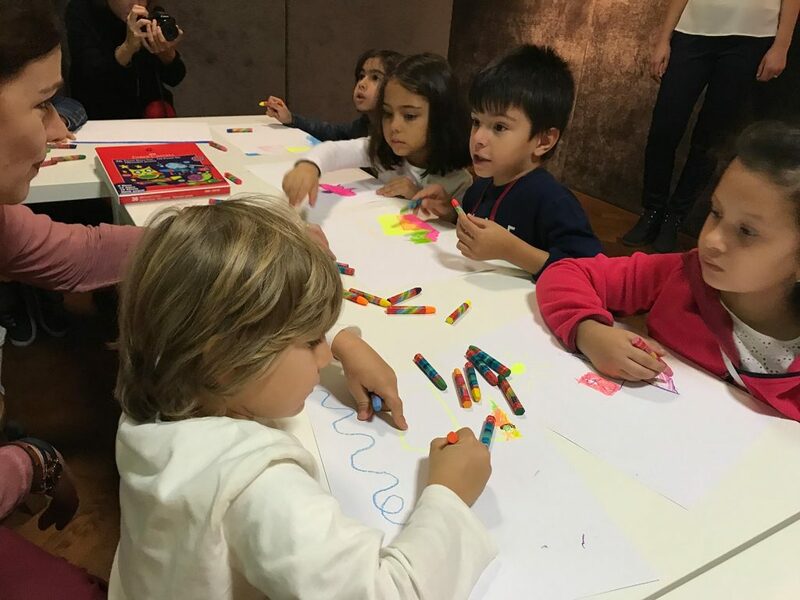 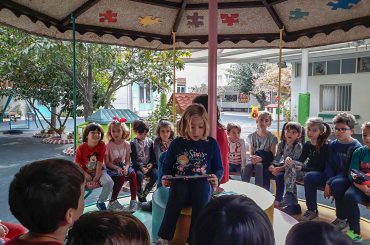 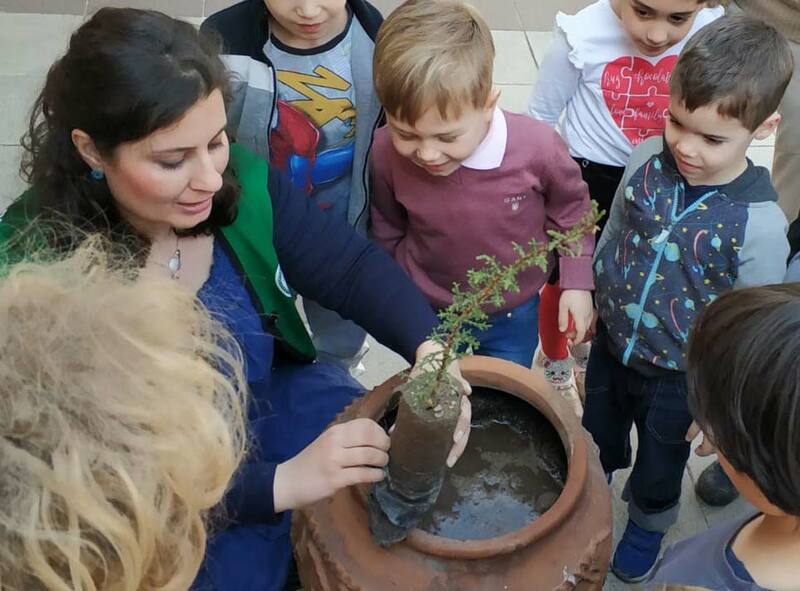 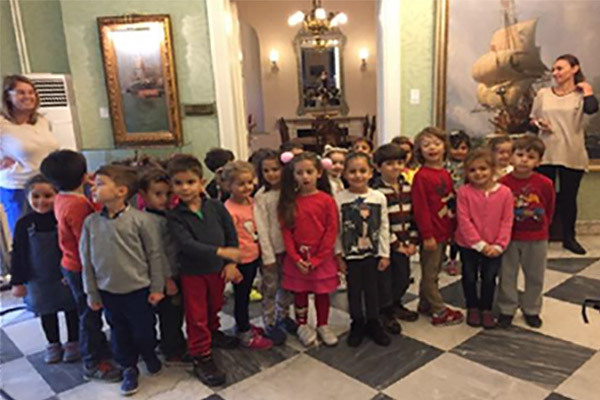 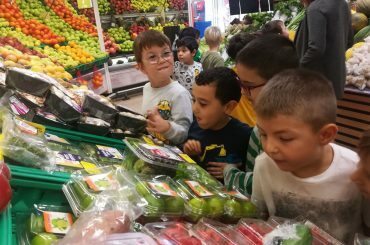 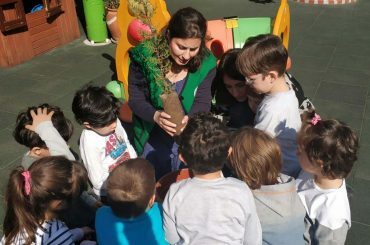 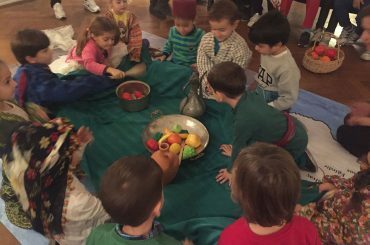 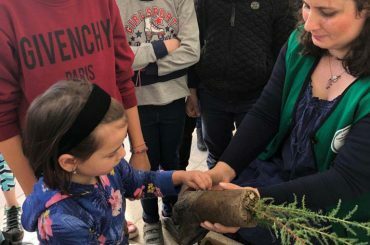 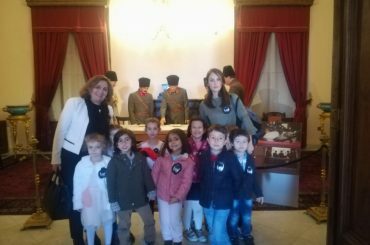 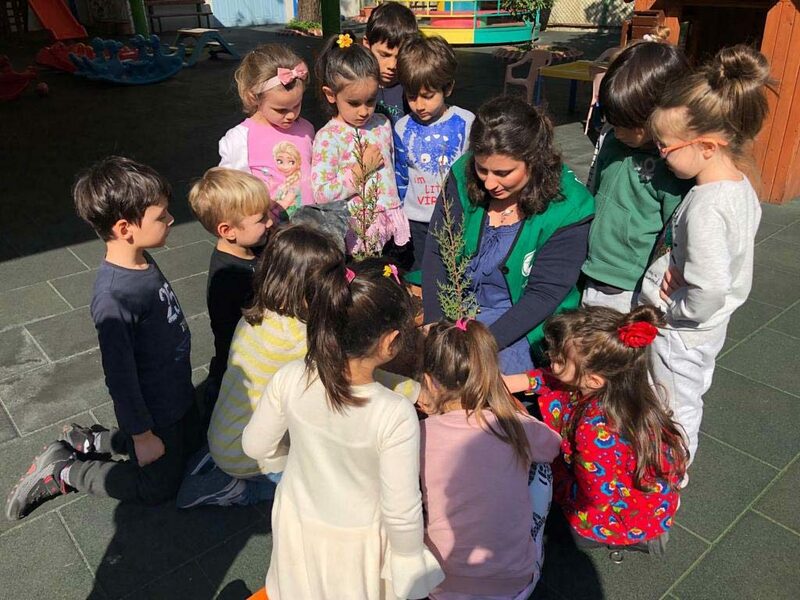 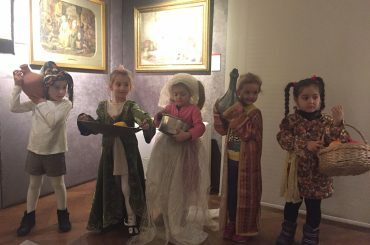 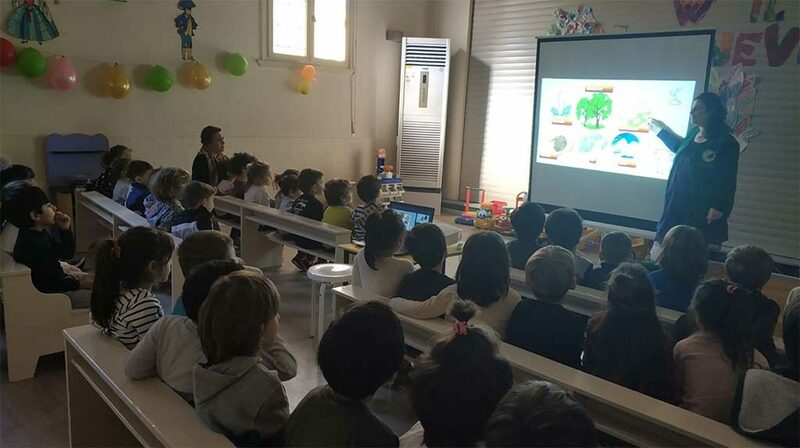 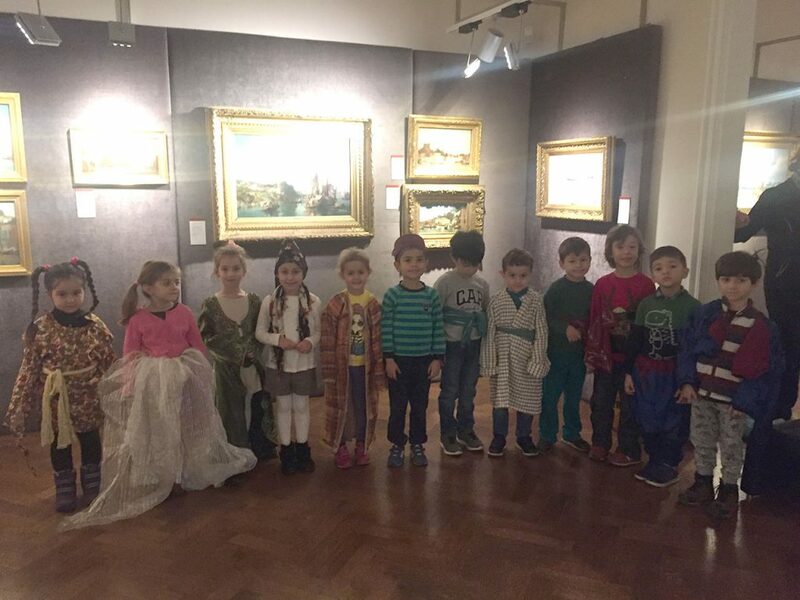 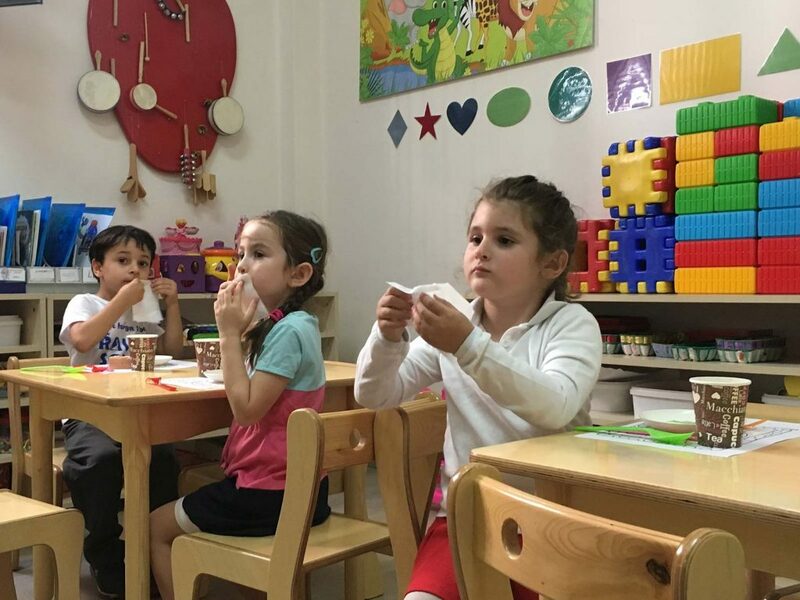 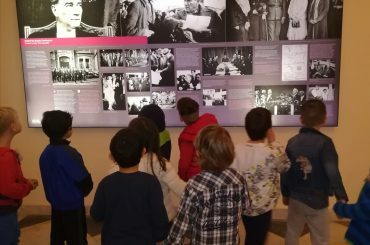 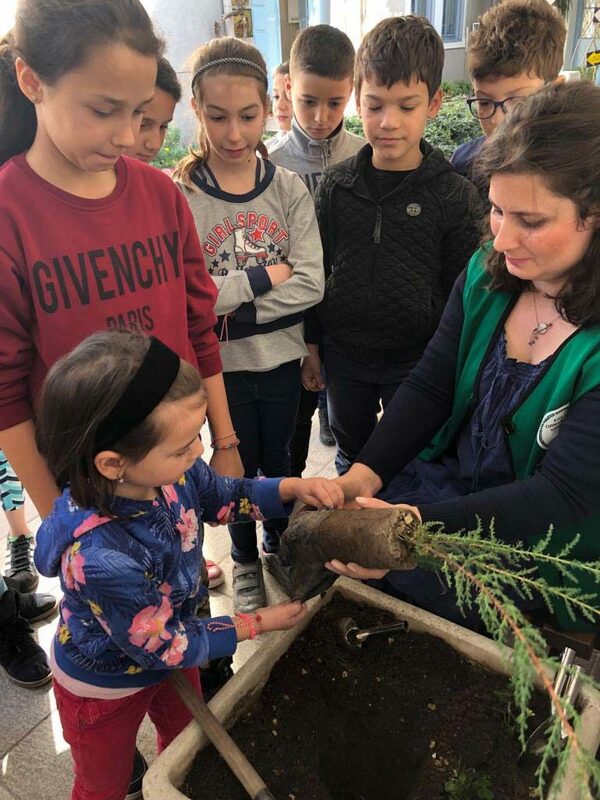 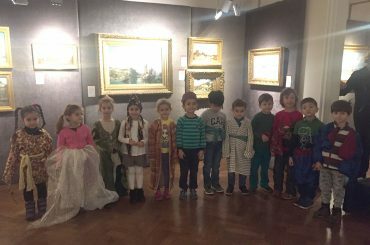 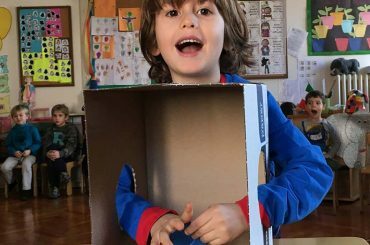 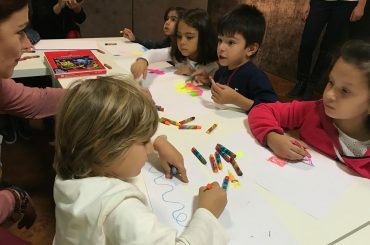 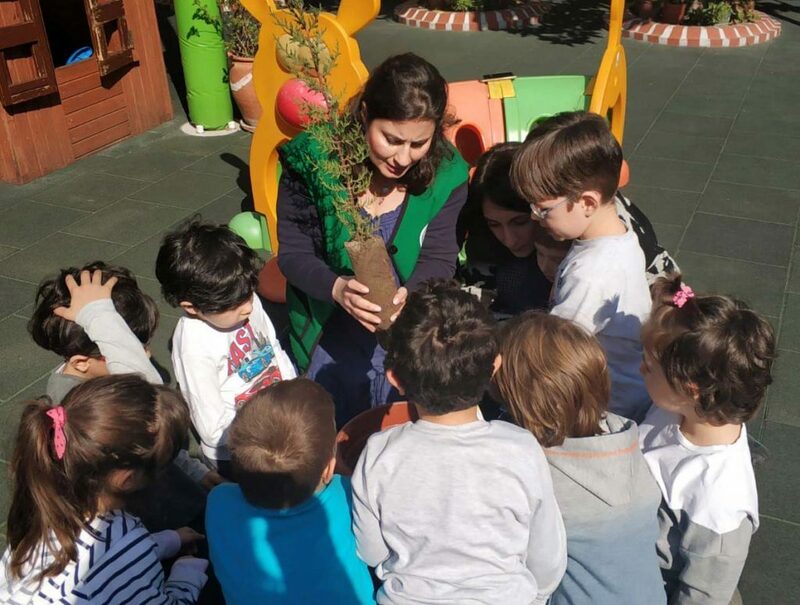 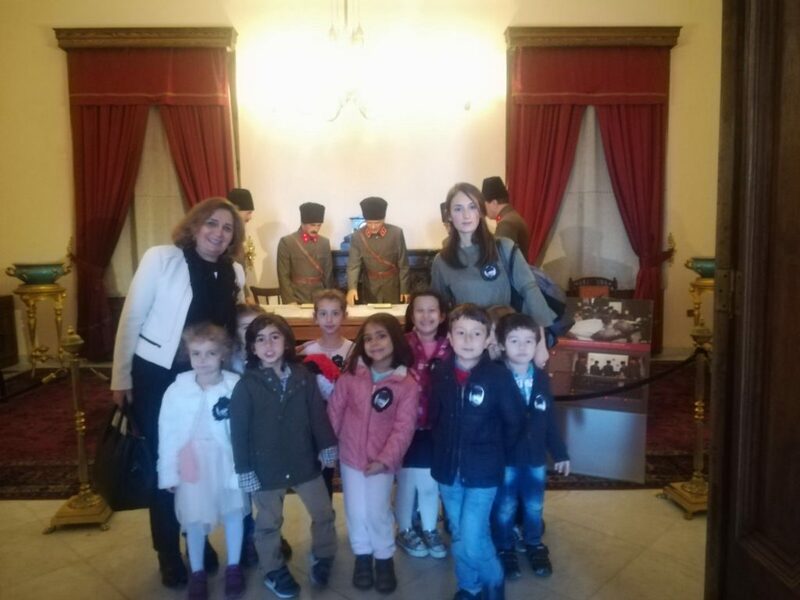 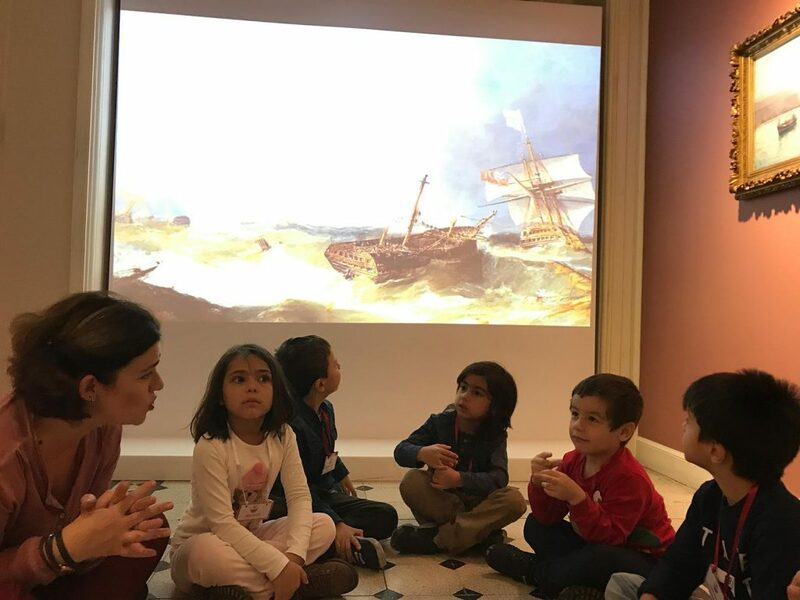 On the 10th of November, on the occasion of the commemoration of Atatürk’s death, kindergarten students visited the Atatürk Museum. 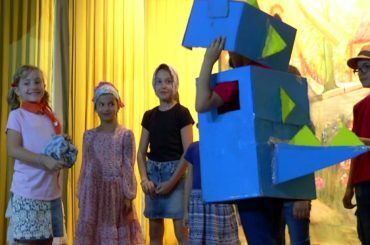 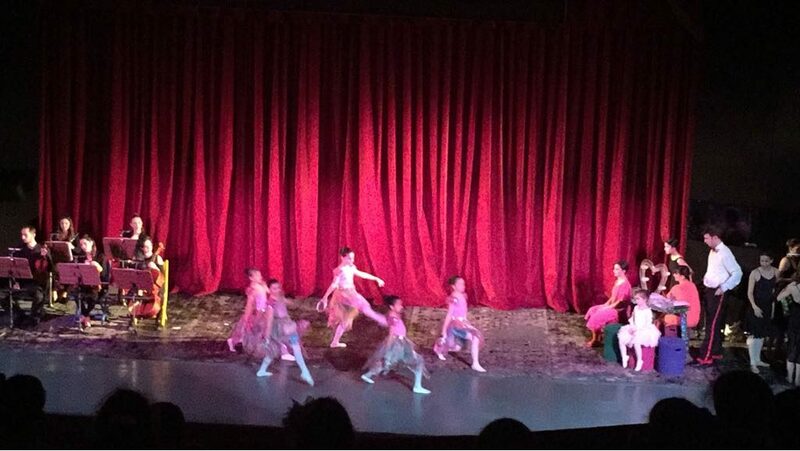 We had fun watching this show on diversity and tolerance. 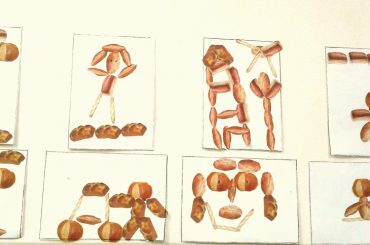 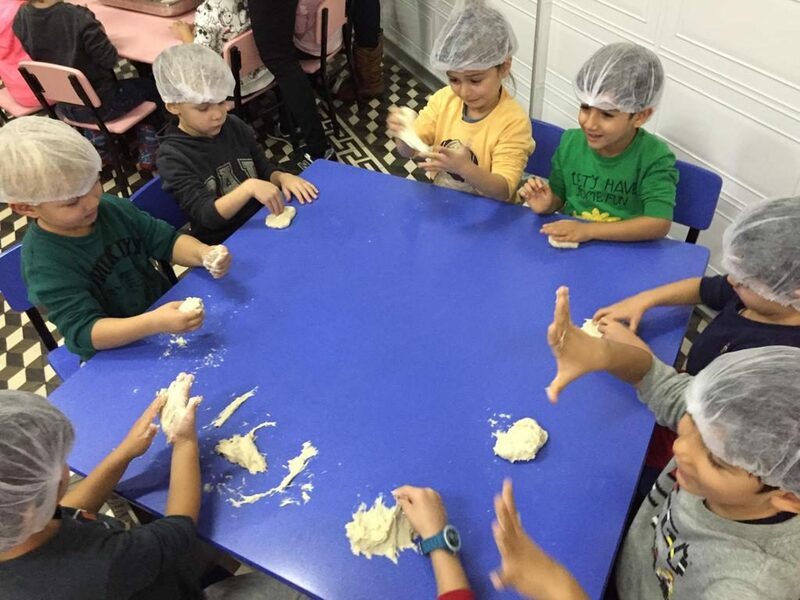 Kindergarten classes have been engaged in an inquiry-based project on bread. 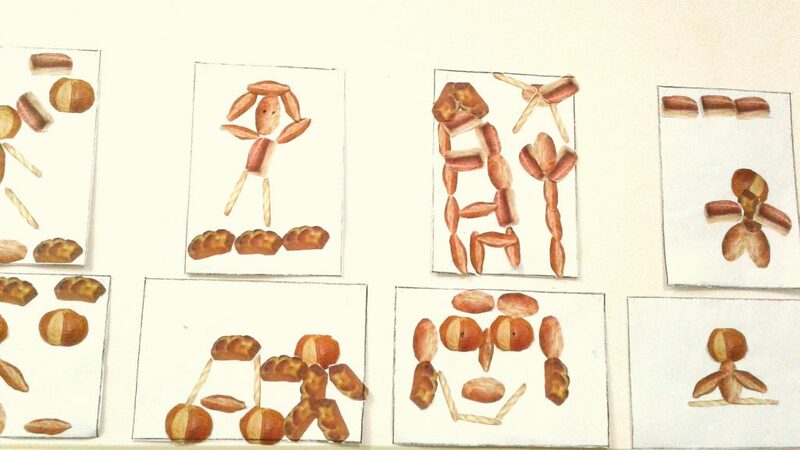 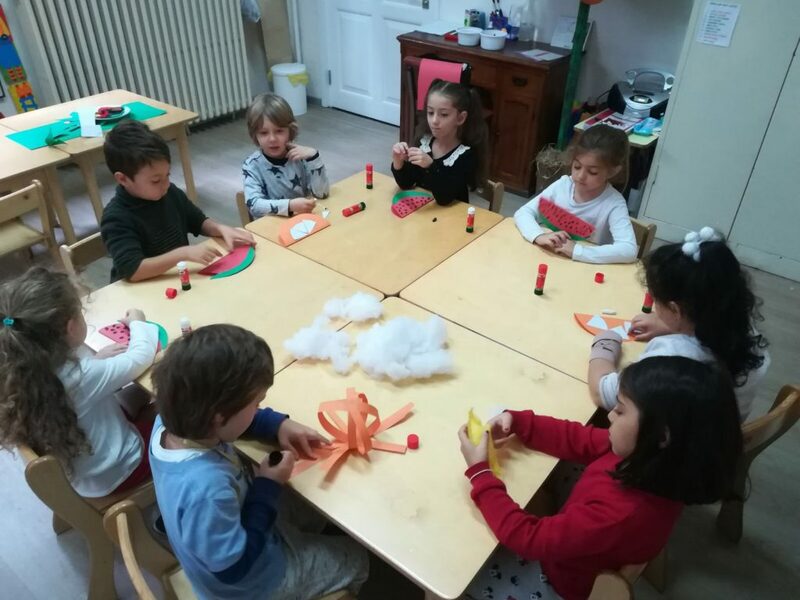 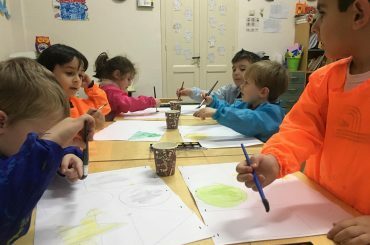 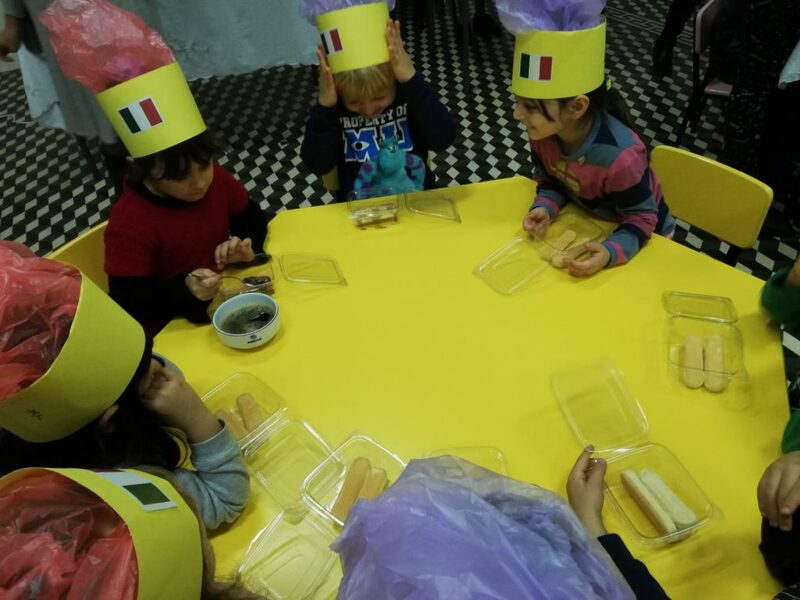 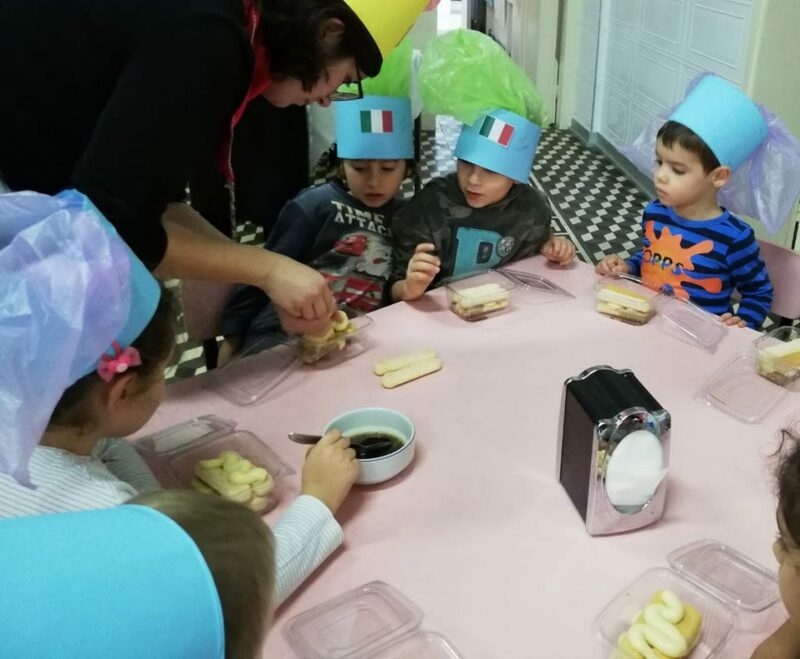 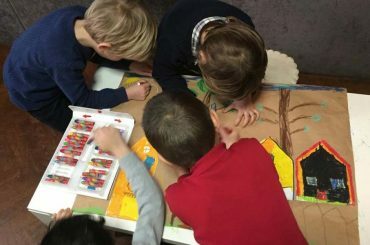 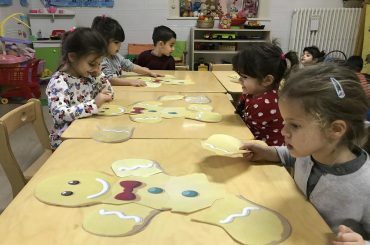 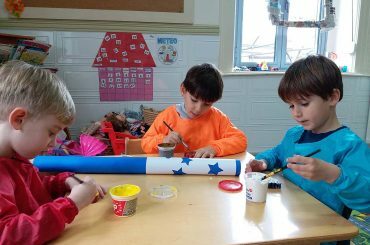 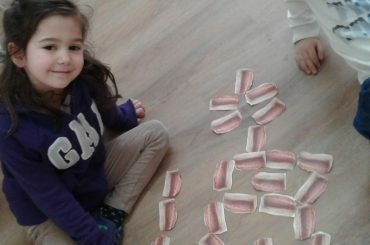 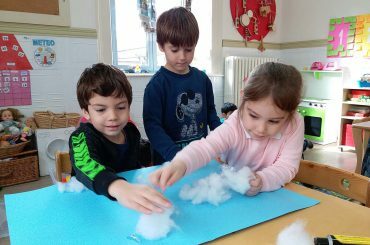 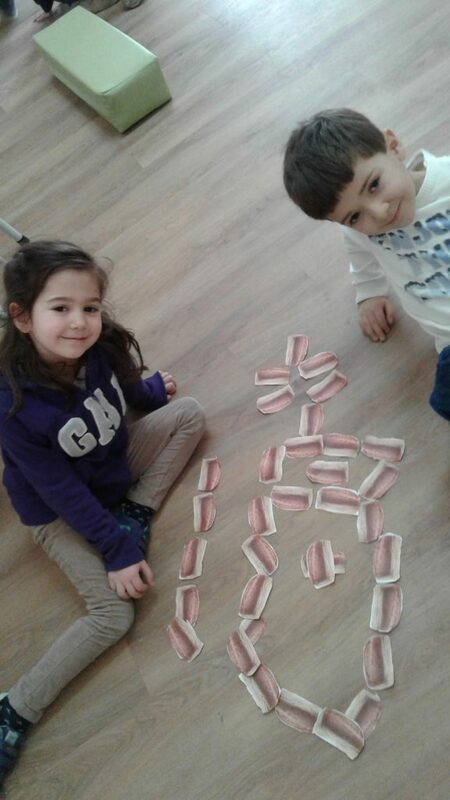 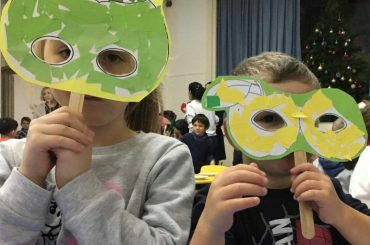 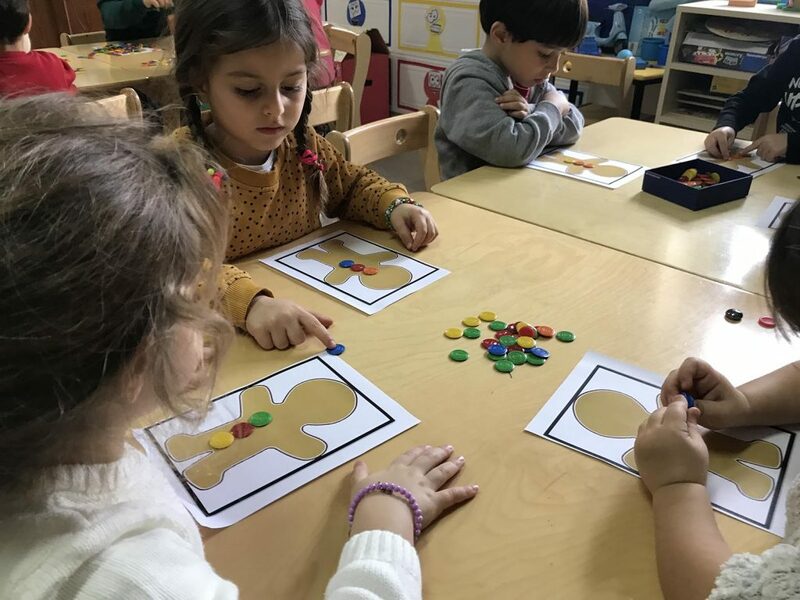 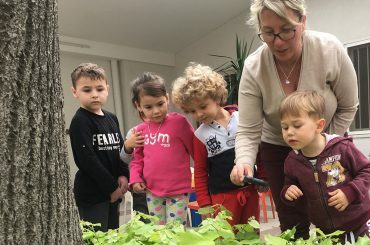 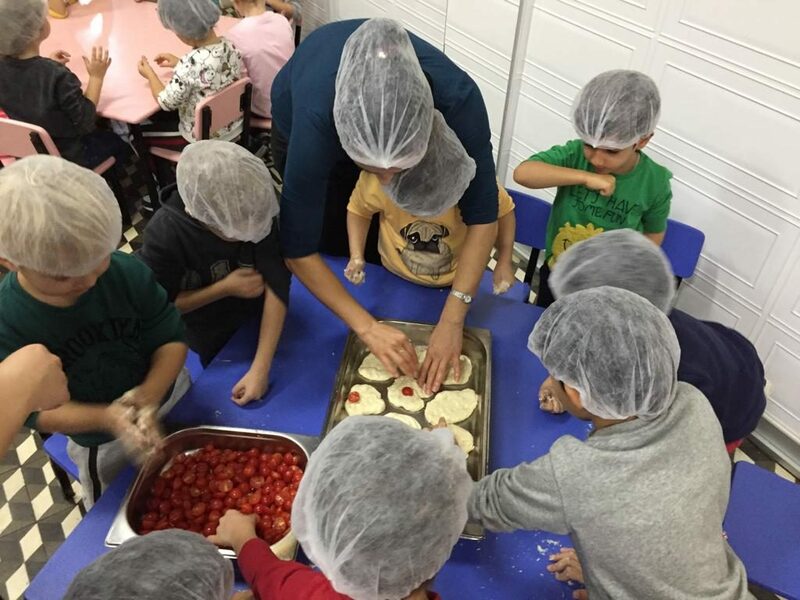 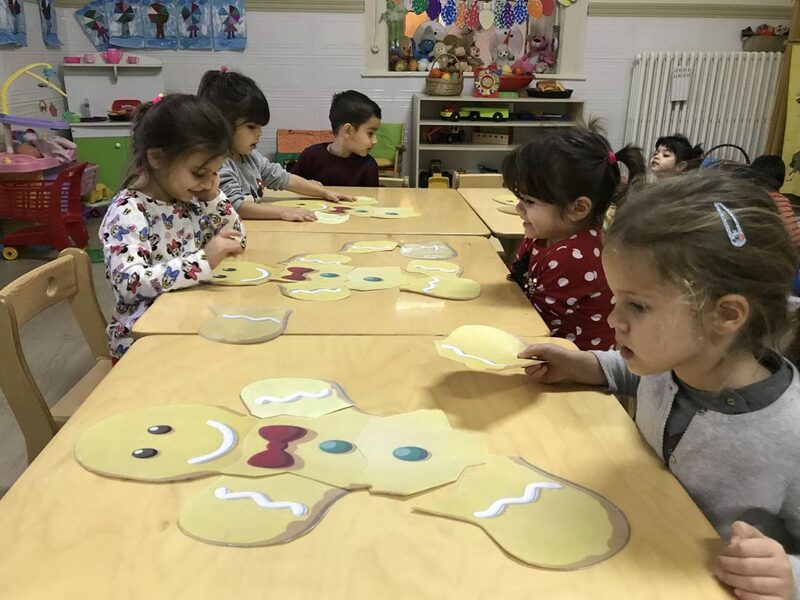 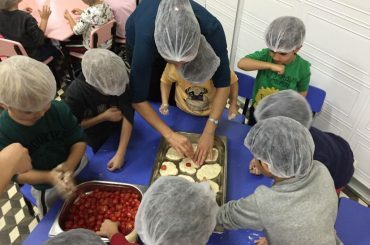 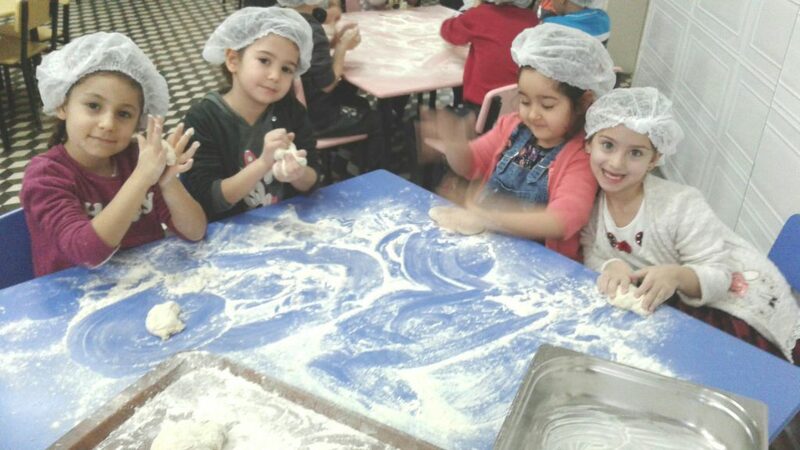 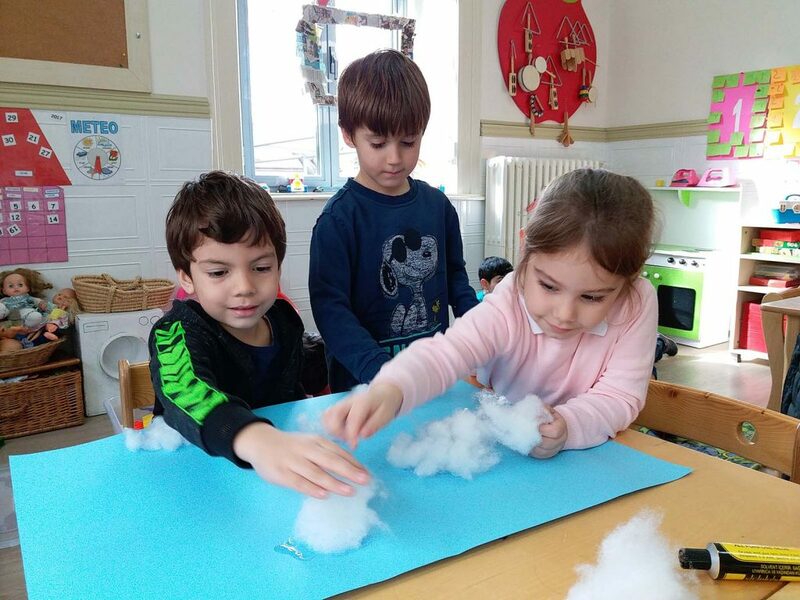 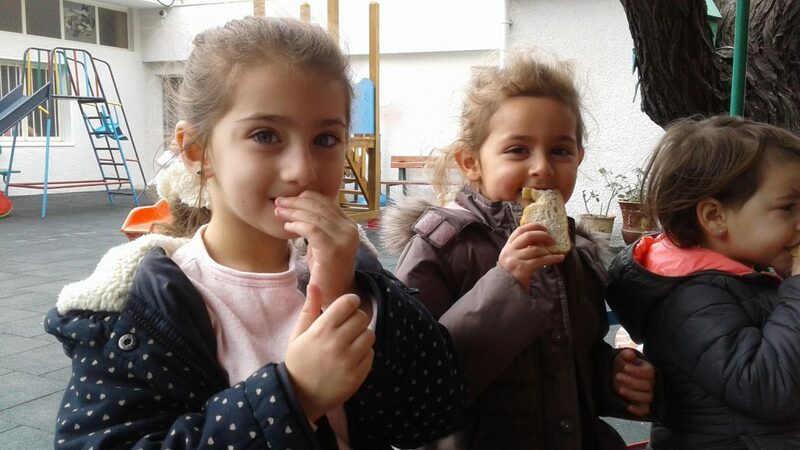 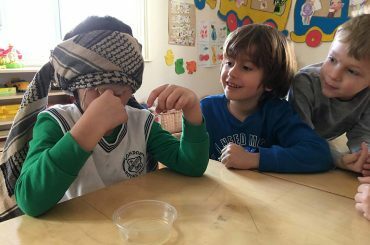 We started our work with the story of bread and we supported the activities with experiments, art activities, games, mathematics studies, reading and writing activities. 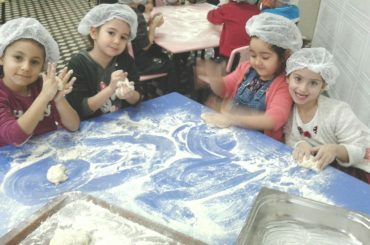 We also experienced the excitement of baking in our kitchen. 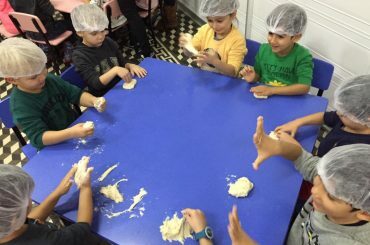 We talked about the wasted bread and tried to find solutions to prevent it. 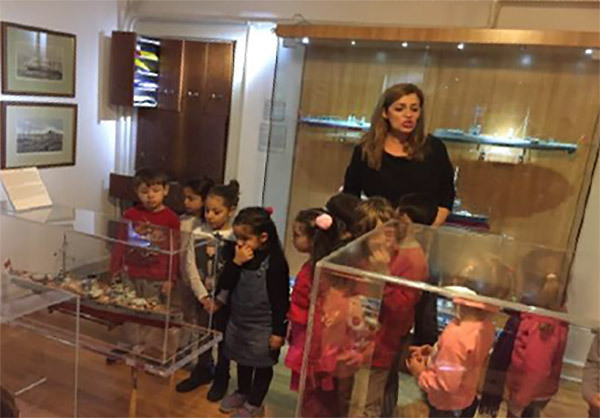 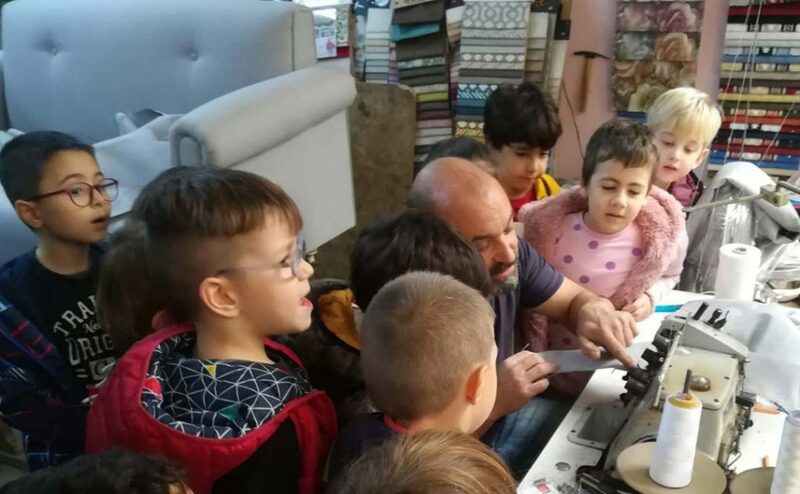 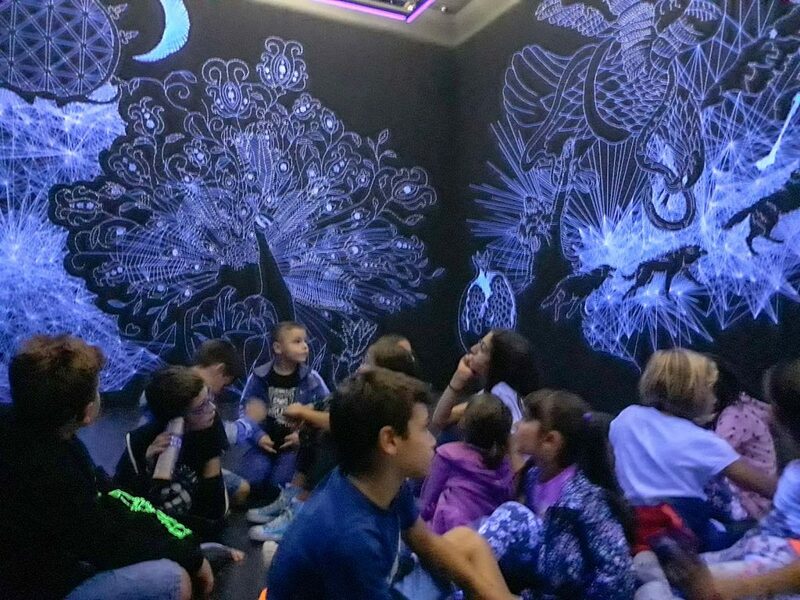 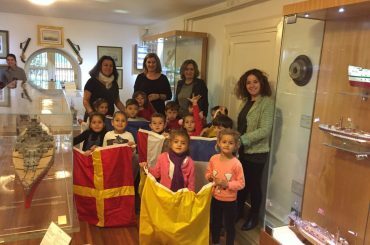 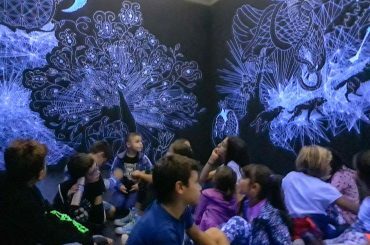 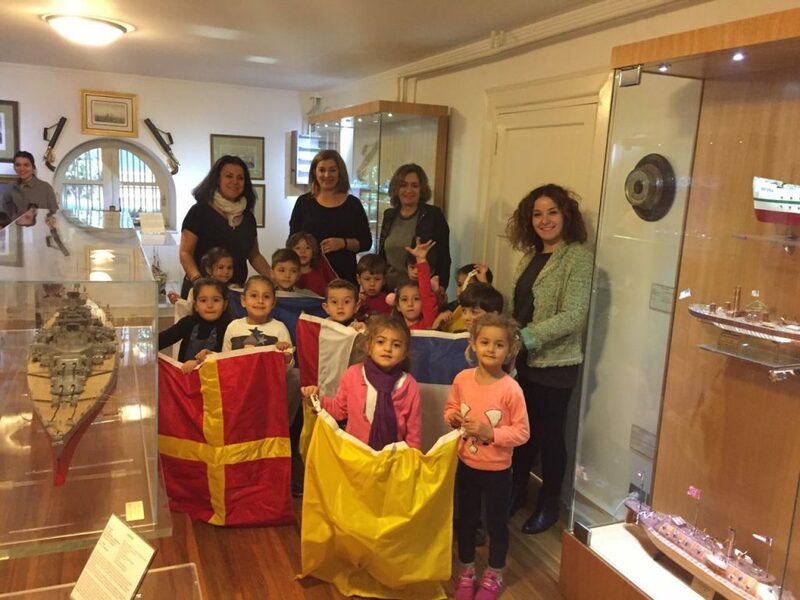 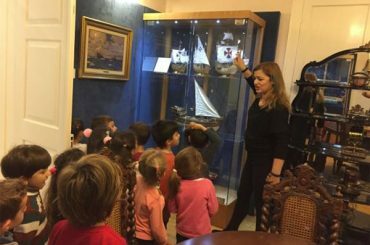 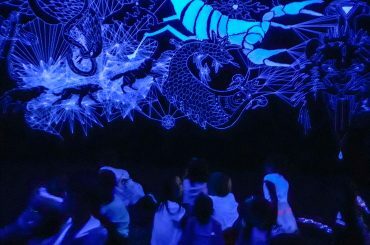 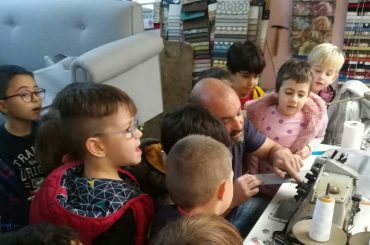 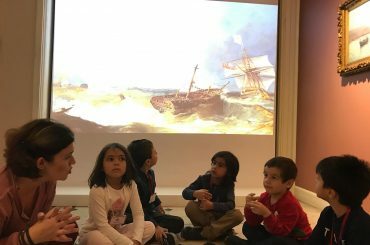 Elementary and Kindergarten students’ visit to Arkas Maritime History Center. 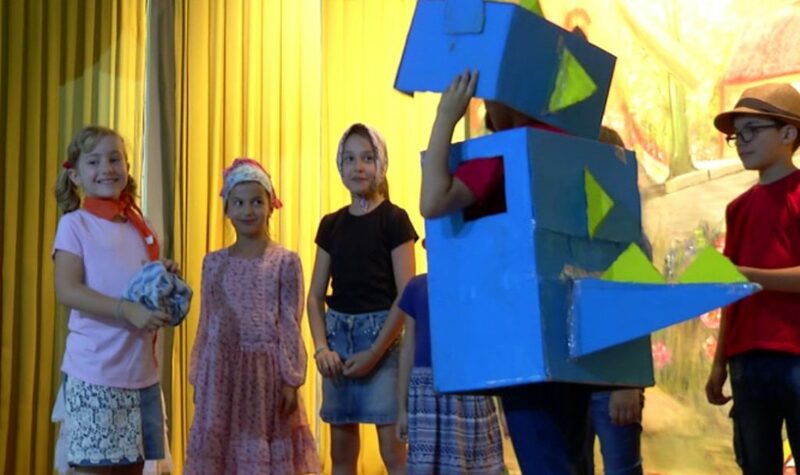 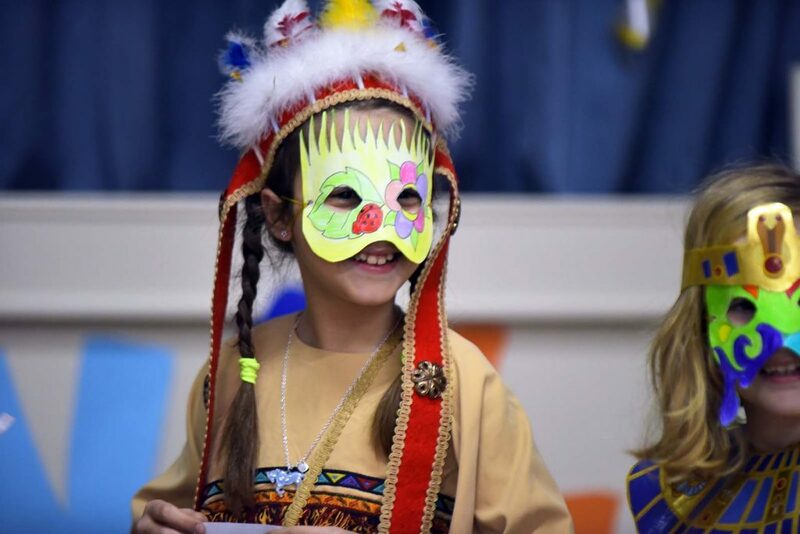 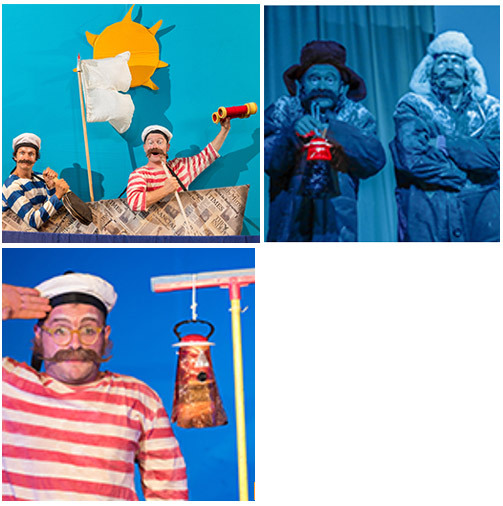 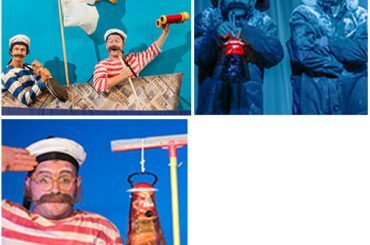 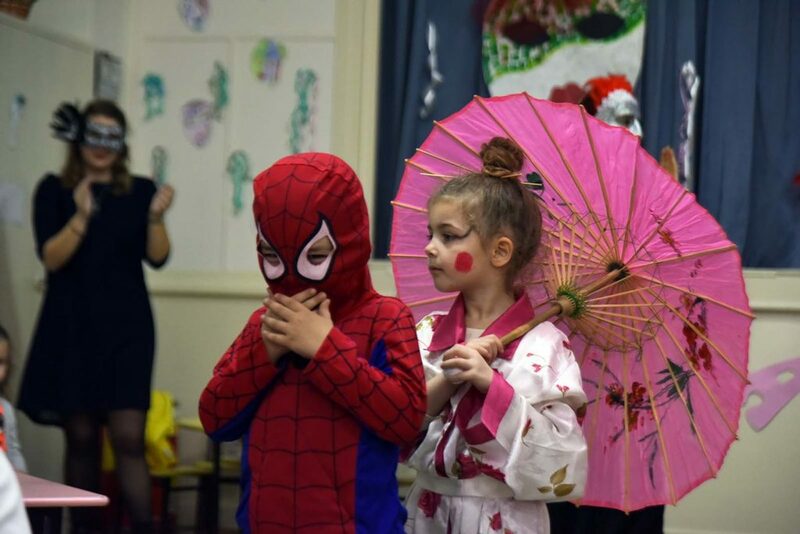 Students performed a “Creative Drama” to learn about maritime and their lives. 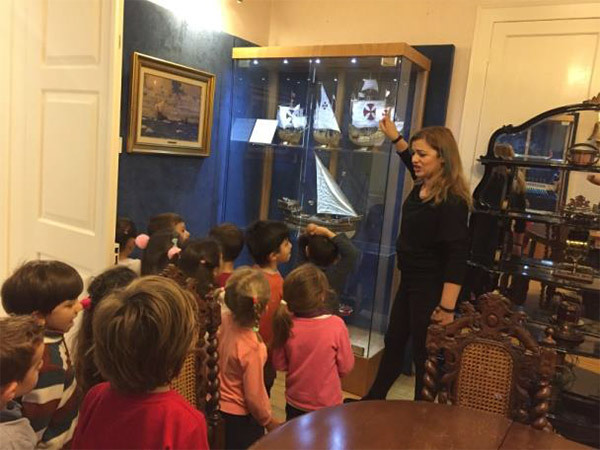 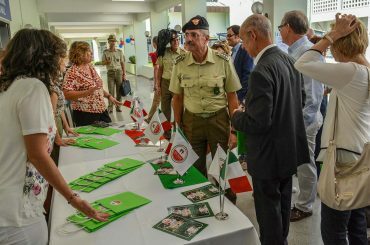 They were also informed about the maritime history and the differences between the ships in history and today’s ships. 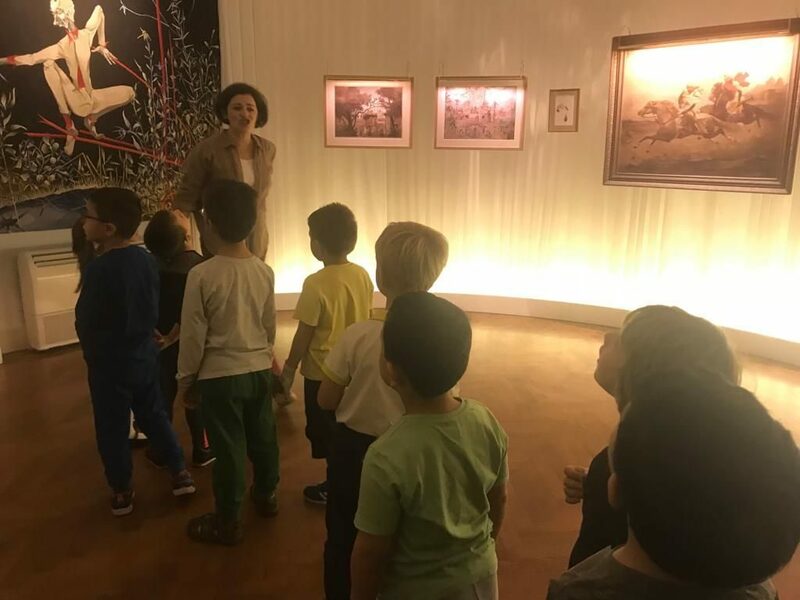 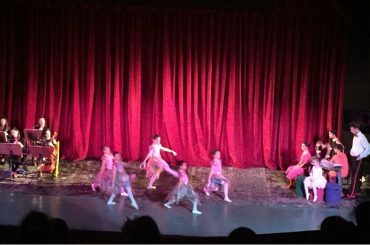 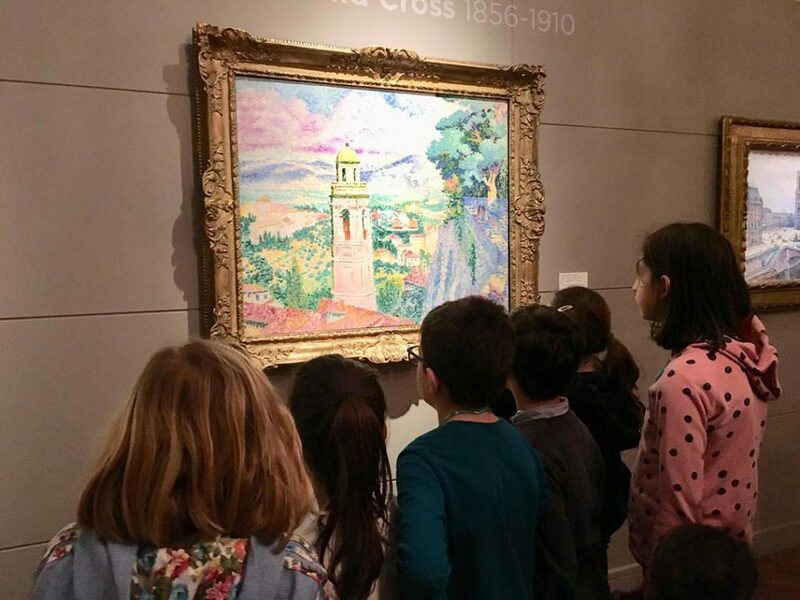 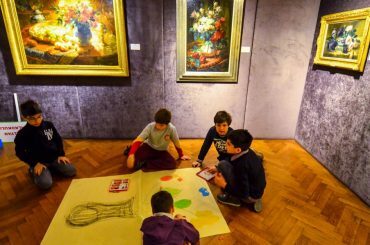 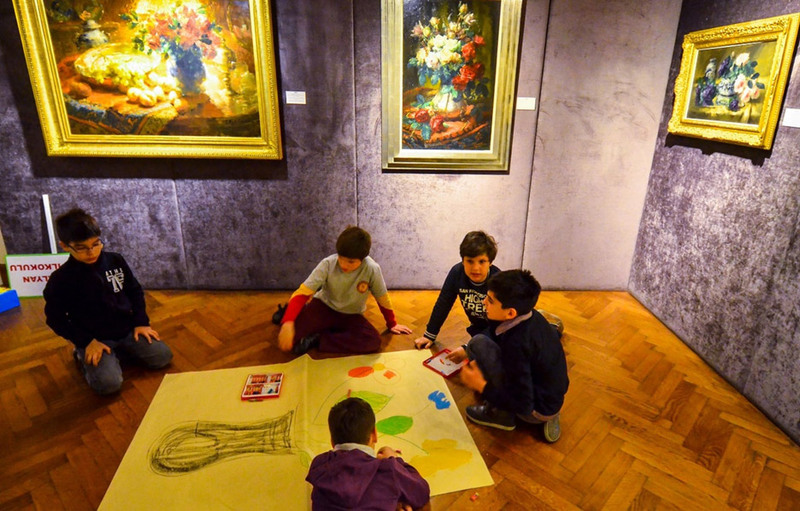 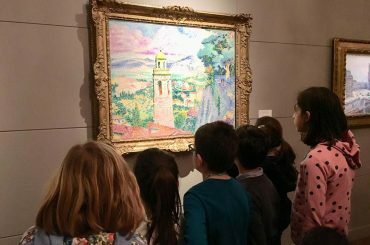 At Arkas Art Center, where we went with our students, we studied the pictures of famous painters and learned about their lives. 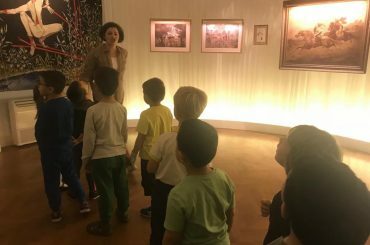 We choose a painter and revive his period by made a portrait of the lives of people living at that time … We returned to our school and we transformed in painters and made creative pictures.